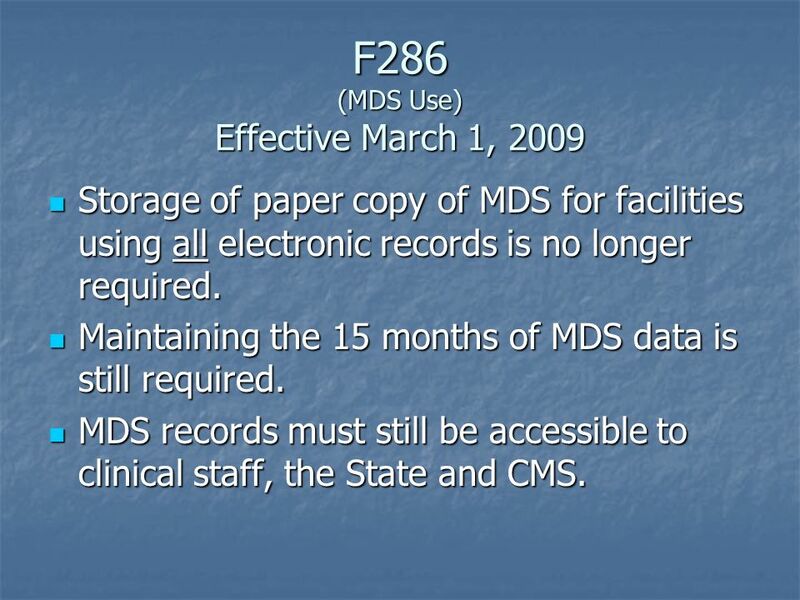 Storage of paper copy of MDS for facilities using all electronic records is no longer required. 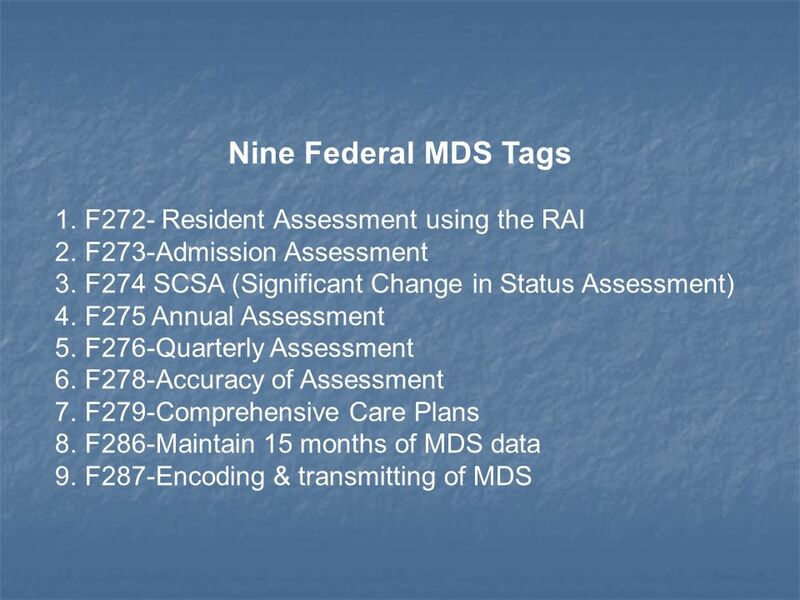 Maintaining the 15 months of MDS data is still required. 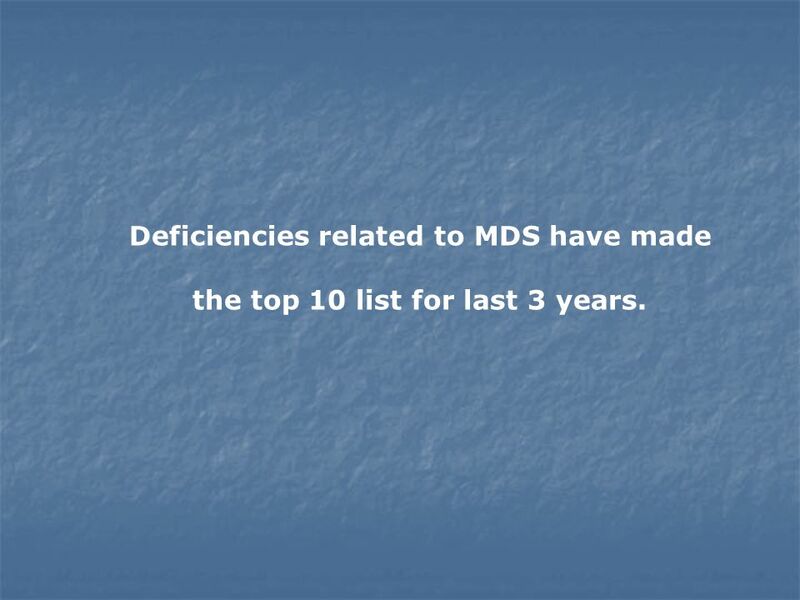 MDS records must still be accessible to clinical staff, the State and CMS. the top 10 list for last 3 years. 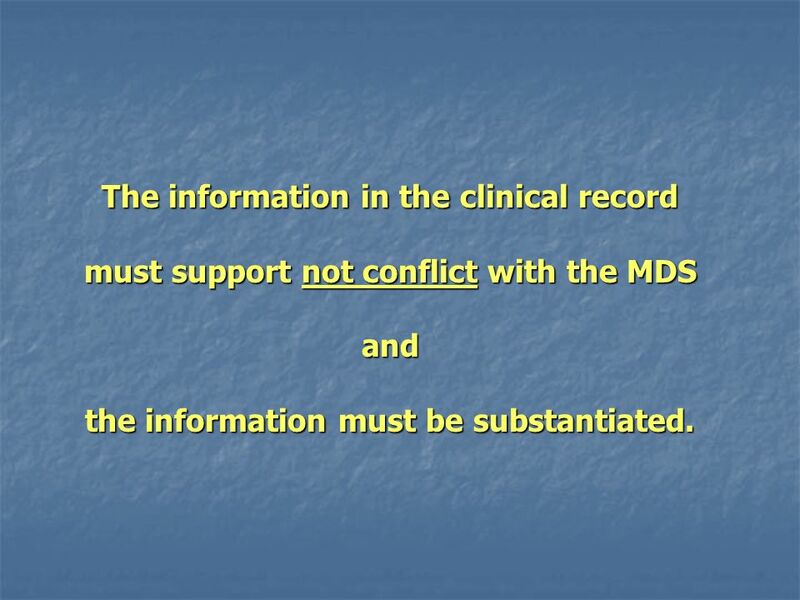 must support not conflict with the MDS and the information must be substantiated. 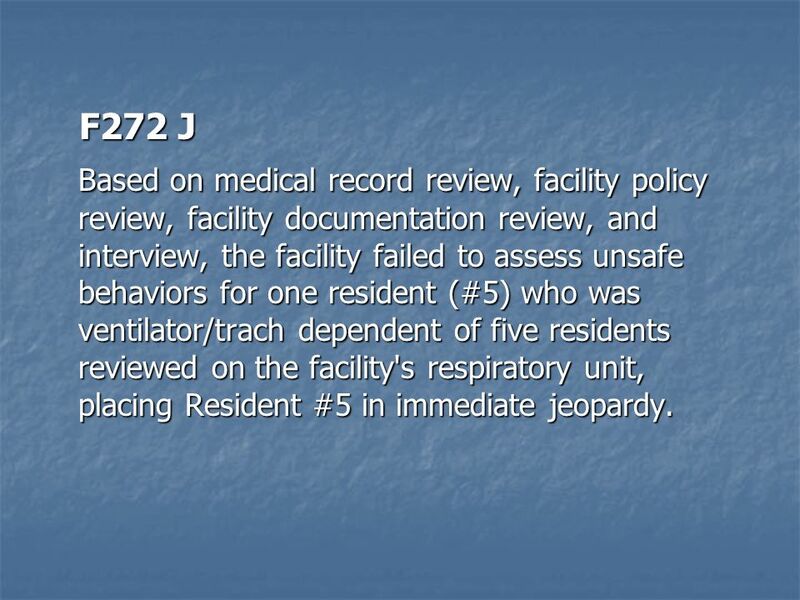 14 F272 J Based on medical record review, facility policy review, facility documentation review, and interview, the facility failed to assess unsafe behaviors for one resident (#5) who was ventilator/trach dependent of five residents reviewed on the facility's respiratory unit, placing Resident #5 in immediate jeopardy. 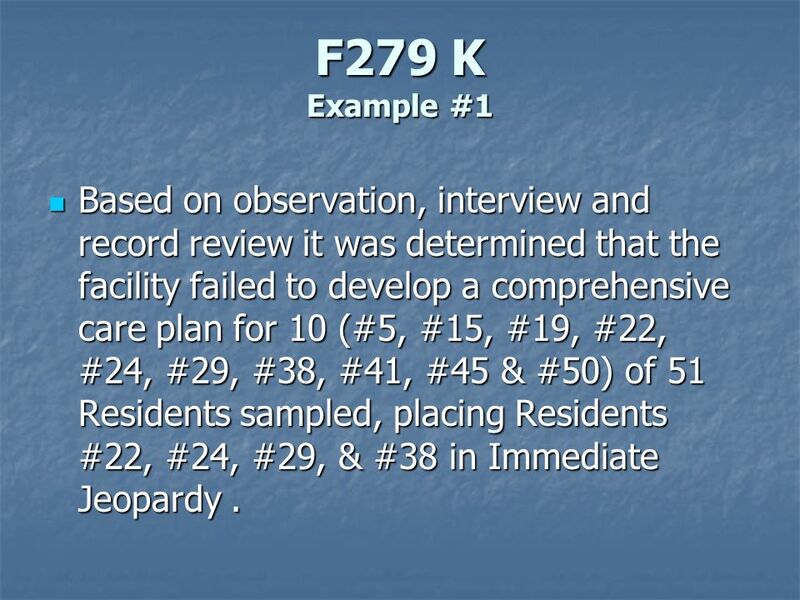 16 F279 K Example #1 Based on observation, interview and record review it was determined that the facility failed to develop a comprehensive care plan for 10 (#5, #15, #19, #22, #24, #29, #38, #41, #45 & #50) of 51 Residents sampled, placing Residents #22, #24, #29, & #38 in Immediate Jeopardy . 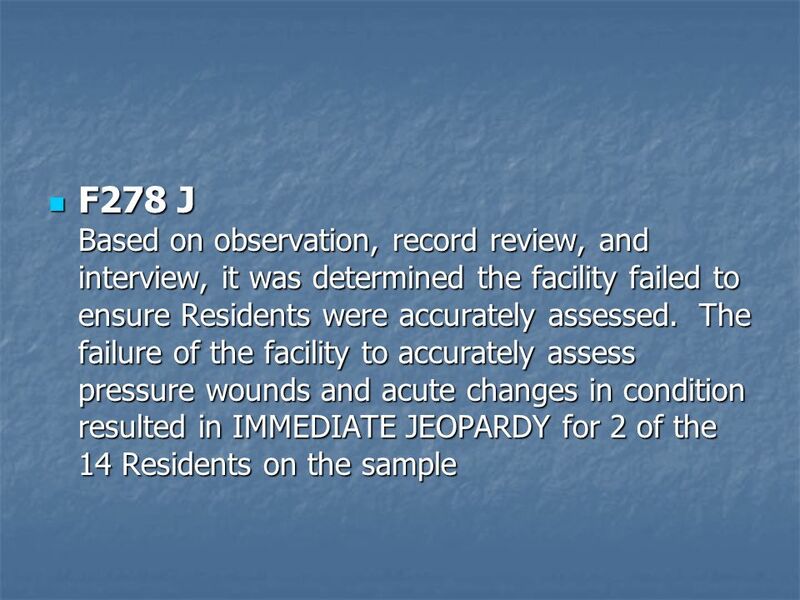 17 F279 J Example #2 Based on medical record review and interviews, it was determined the facility failed to develop a comprehensive care plan for behaviors for 2 Residents (#17 and #5) of 21 sampled Residents. 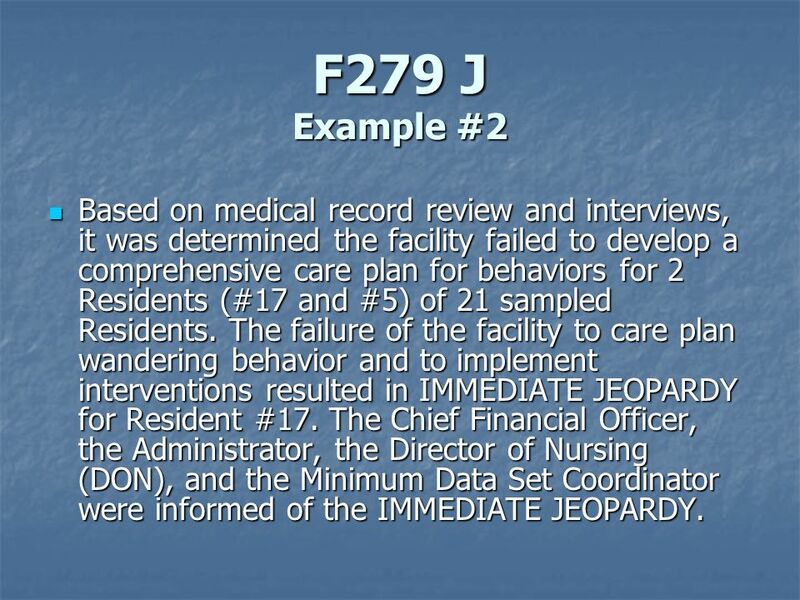 The failure of the facility to care plan wandering behavior and to implement interventions resulted in IMMEDIATE JEOPARDY for Resident #17. 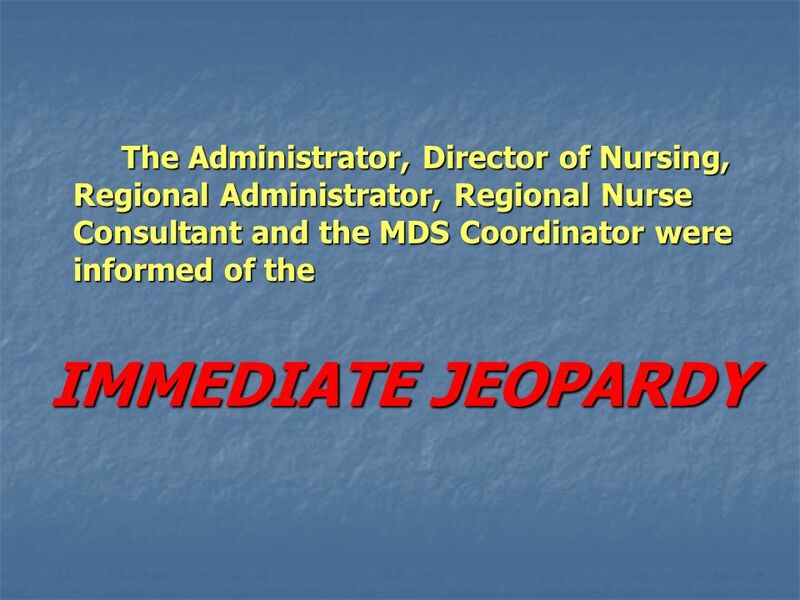 The Chief Financial Officer, the Administrator, the Director of Nursing (DON), and the Minimum Data Set Coordinator were informed of the IMMEDIATE JEOPARDY. Who gathers the data? 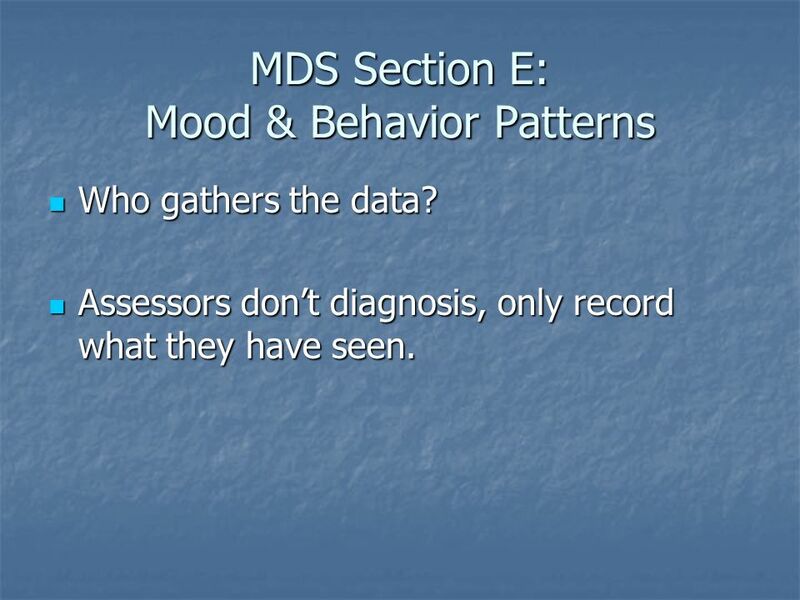 Assessors don’t diagnosis, only record what they have seen. Need documentation. If not in place, put in place. Is there a restraint in use? 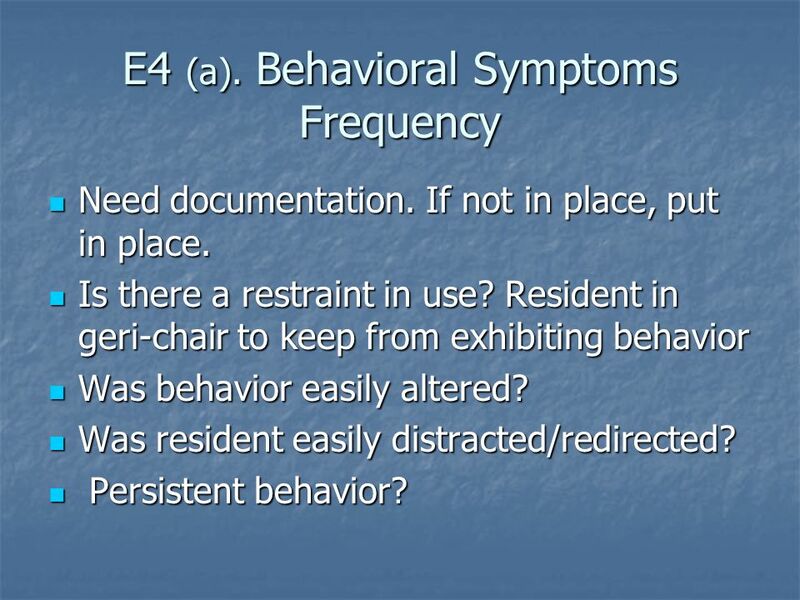 Resident in geri-chair to keep from exhibiting behavior Was behavior easily altered? Was resident easily distracted/redirected? Persistent behavior? 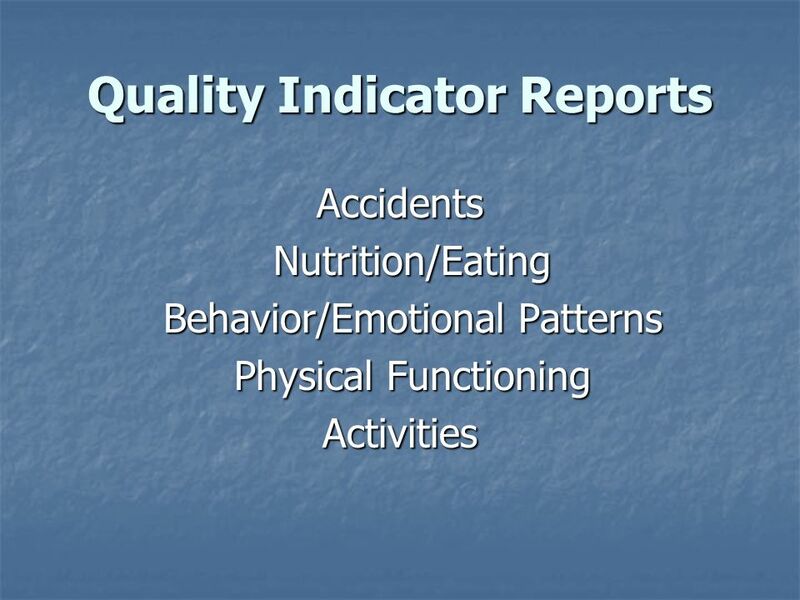 Include: Numbers Frequency Intensity &/or Alterability Review documentation, observation, talk to staff. Look at last quarterly. Who fills this section out? 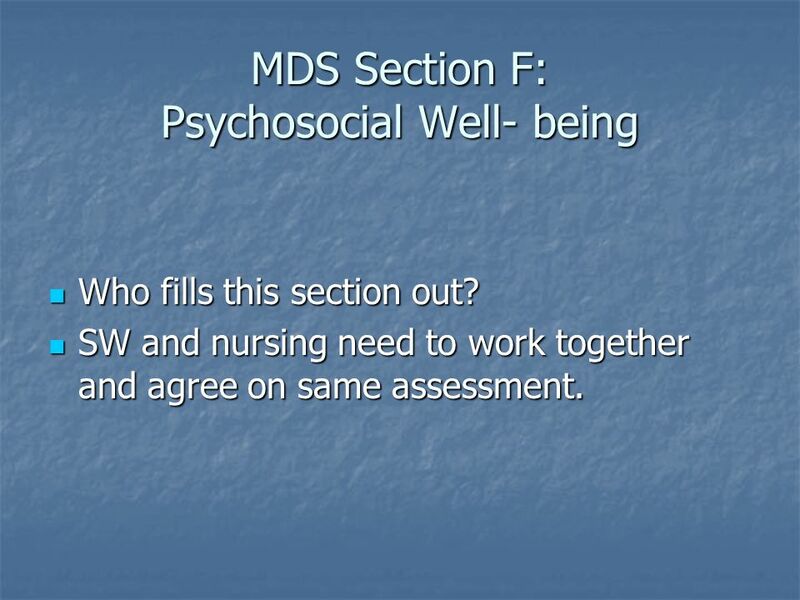 SW and nursing need to work together and agree on same assessment. 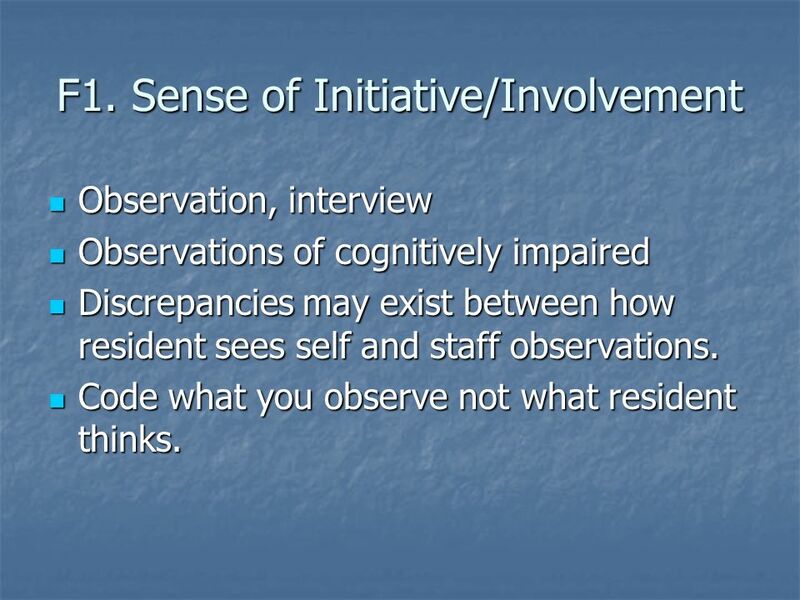 Observation, interview Observations of cognitively impaired Discrepancies may exist between how resident sees self and staff observations. 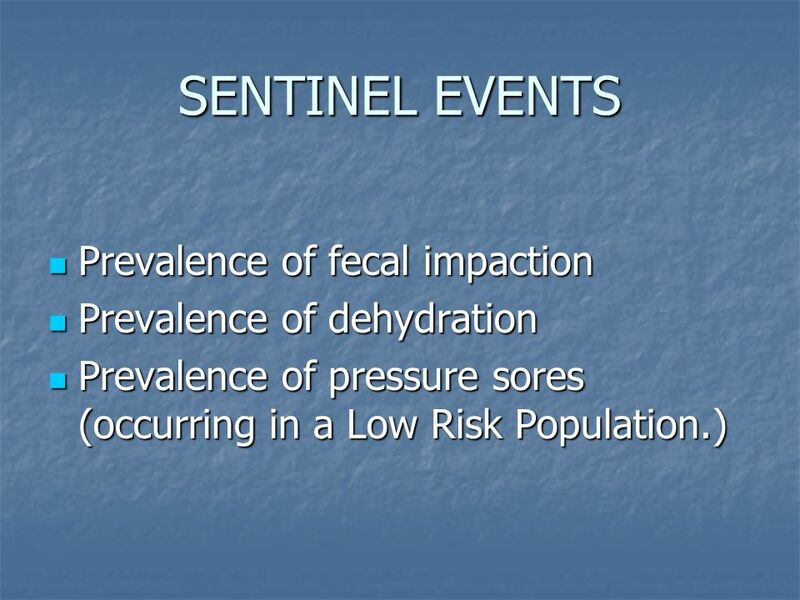 Code what you observe not what resident thinks. 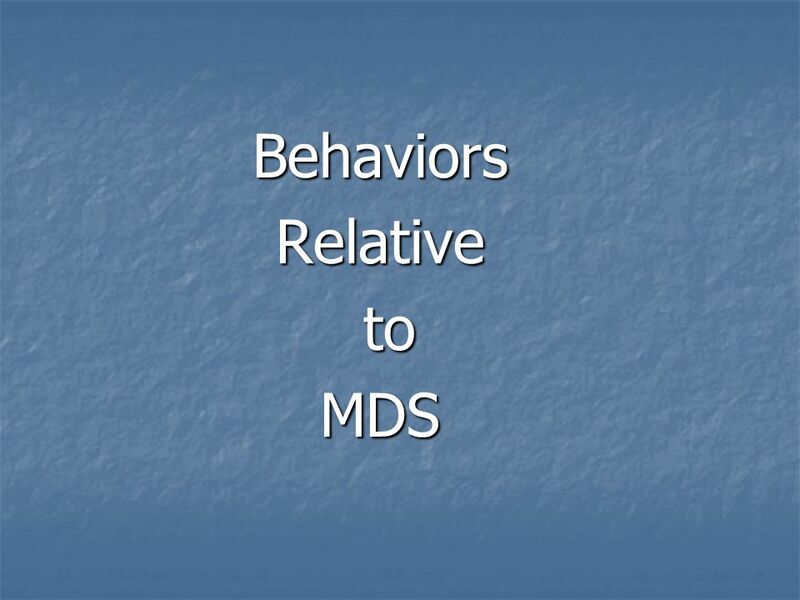 How does the resident interact with others? Observe and interview Observe the resident. Talk to staff and family. You are looking for an overall picture, a consensus view. Document resident’s recognition or acceptance of feeling regarding previous roles or status now that they are in a nursing home. 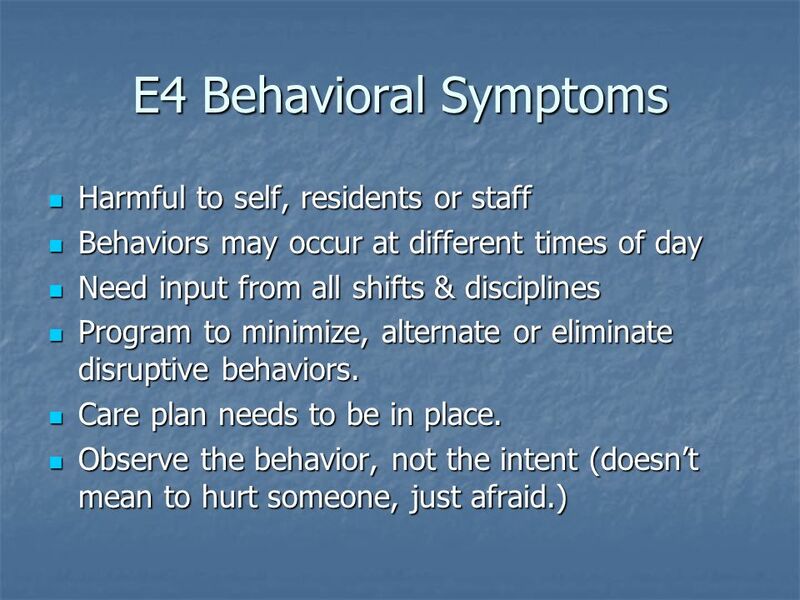 Does your facility have a Behavioral Management Program? 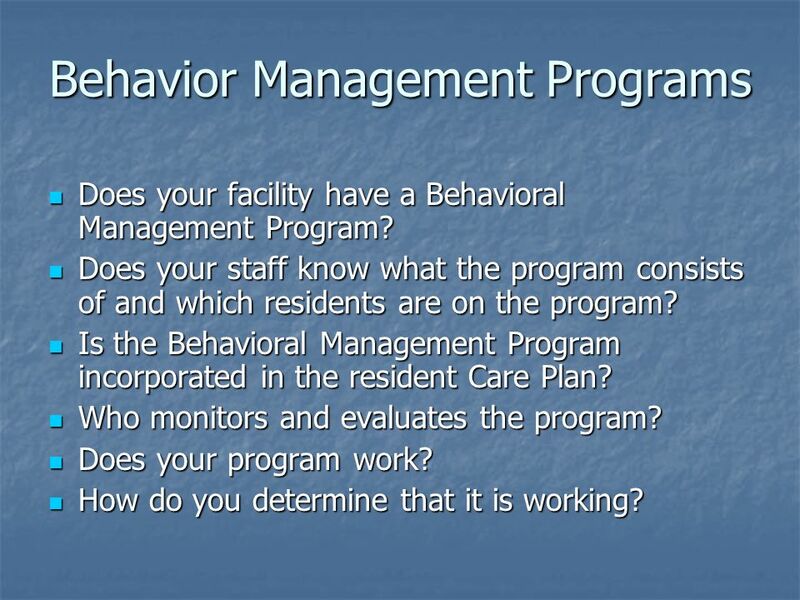 Does your staff know what the program consists of and which residents are on the program? 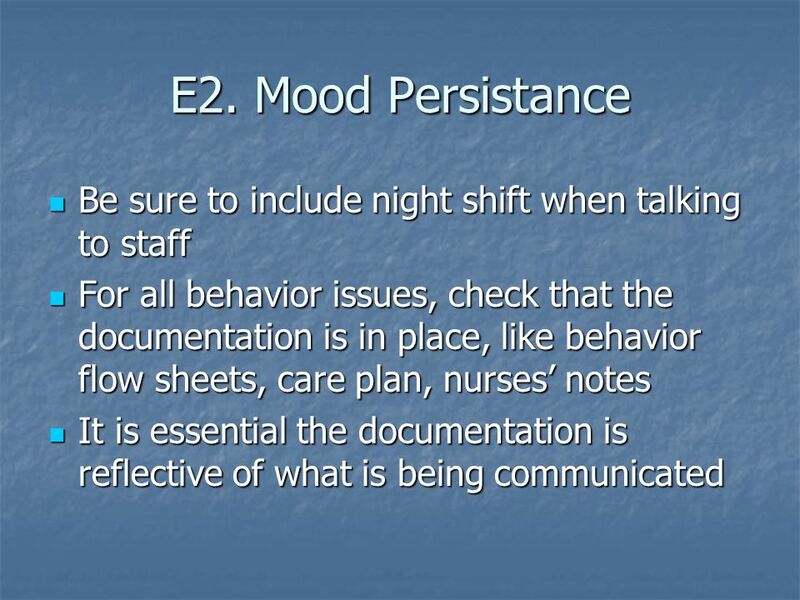 Is the Behavioral Management Program incorporated in the resident Care Plan? 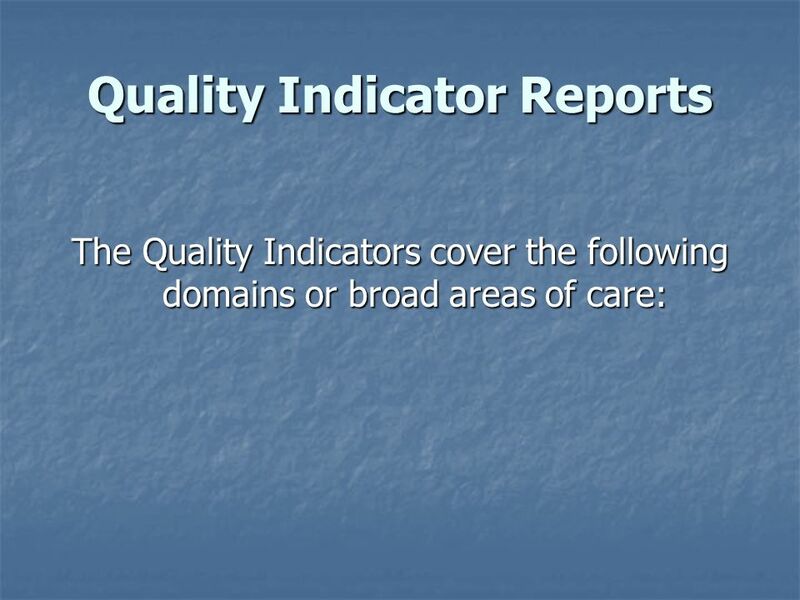 Who monitors and evaluates the program? Does your program work? How do you determine that it is working? 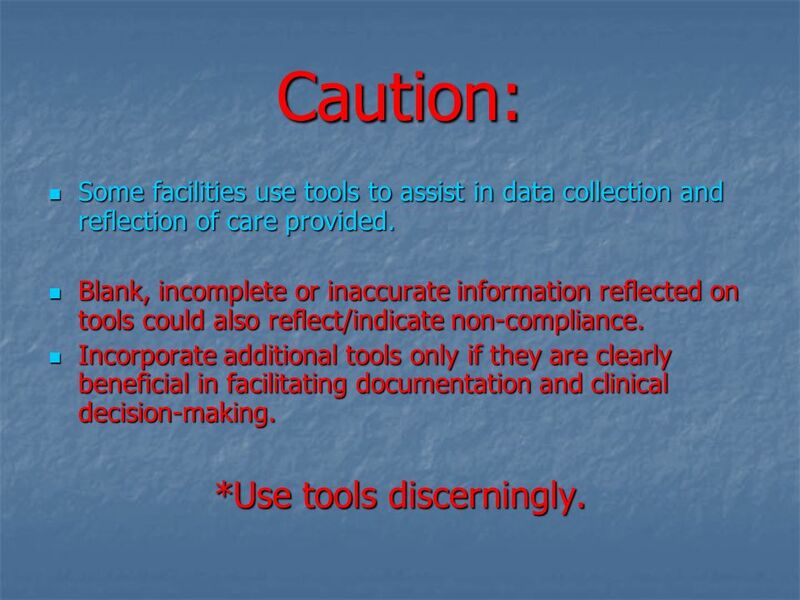 Caution: Some facilities use tools to assist in data collection and reflection of care provided. 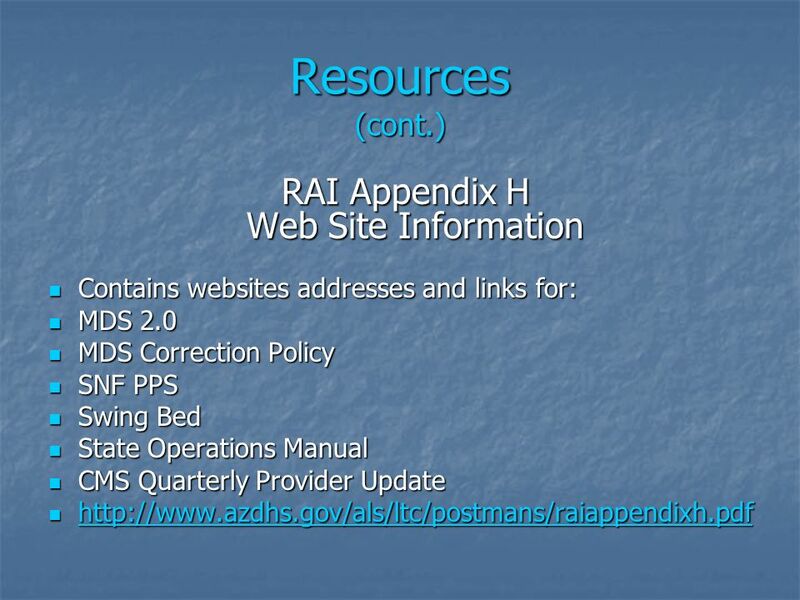 Blank, incomplete or inaccurate information reflected on tools could also reflect/indicate non-compliance. Incorporate additional tools only if they are clearly beneficial in facilitating documentation and clinical decision-making. *Use tools discerningly. 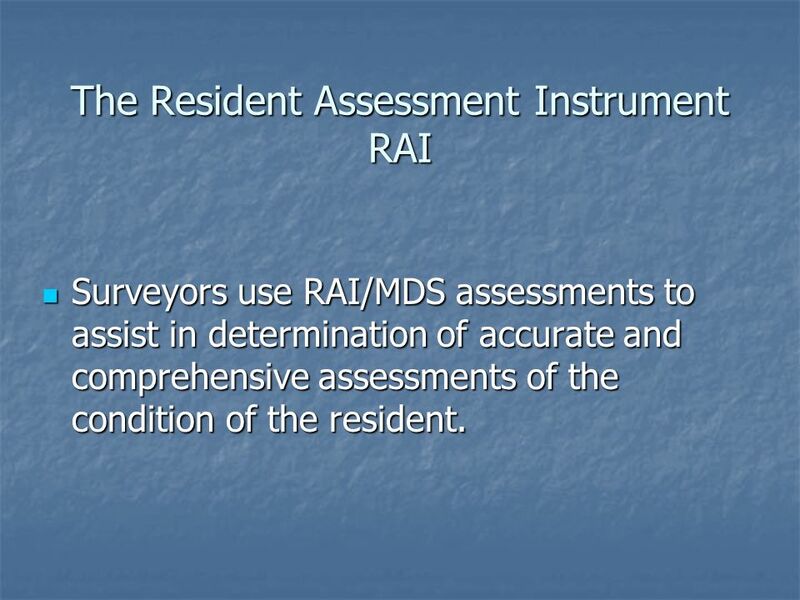 Surveyors use RAI/MDS assessments to assist in determination of accurate and comprehensive assessments of the condition of the resident. 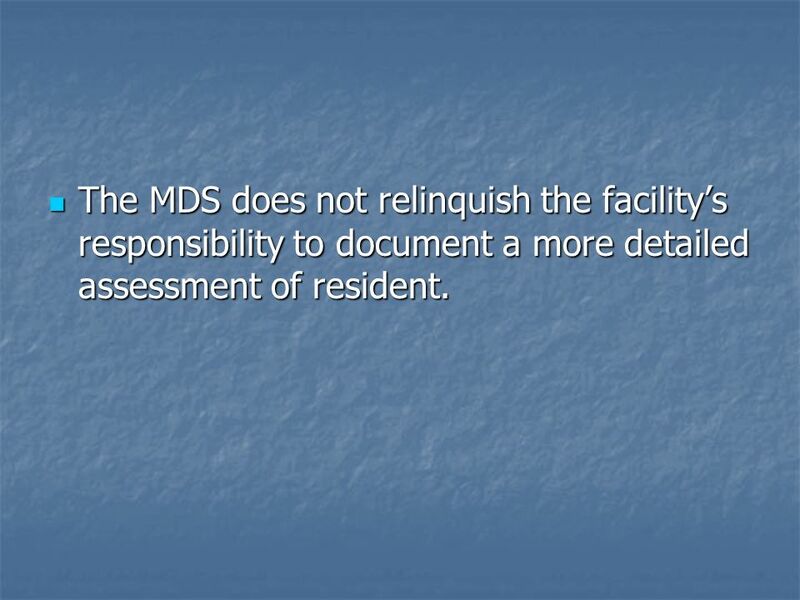 35 The MDS does not relinquish the facility’s responsibility to document a more detailed assessment of resident. 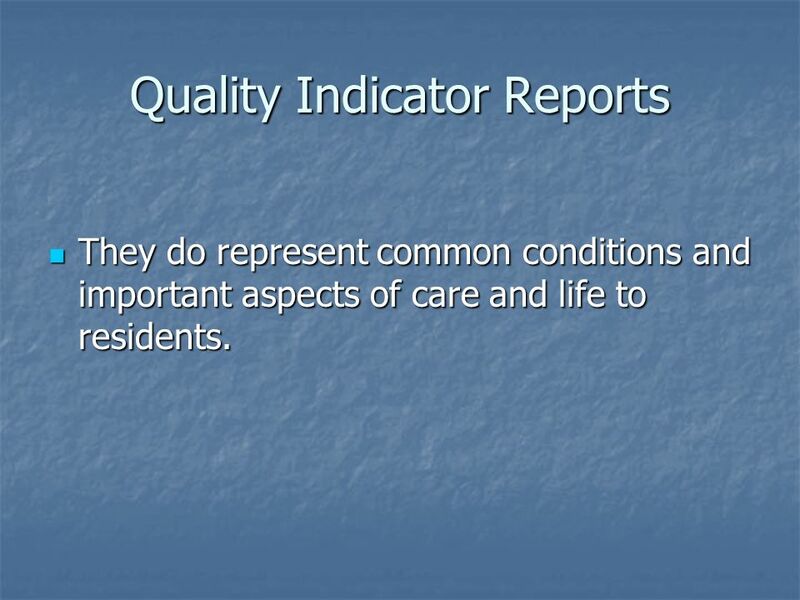 Residents are individuals for whom quality of life and quality of care are equally significant and necessary. 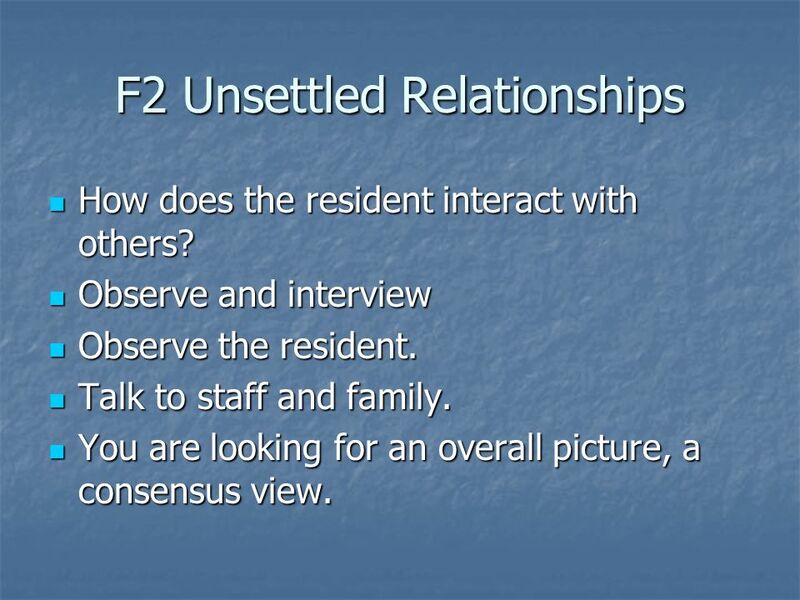 It is important for staff to gather definitive information on a resident’s strengths and needs. 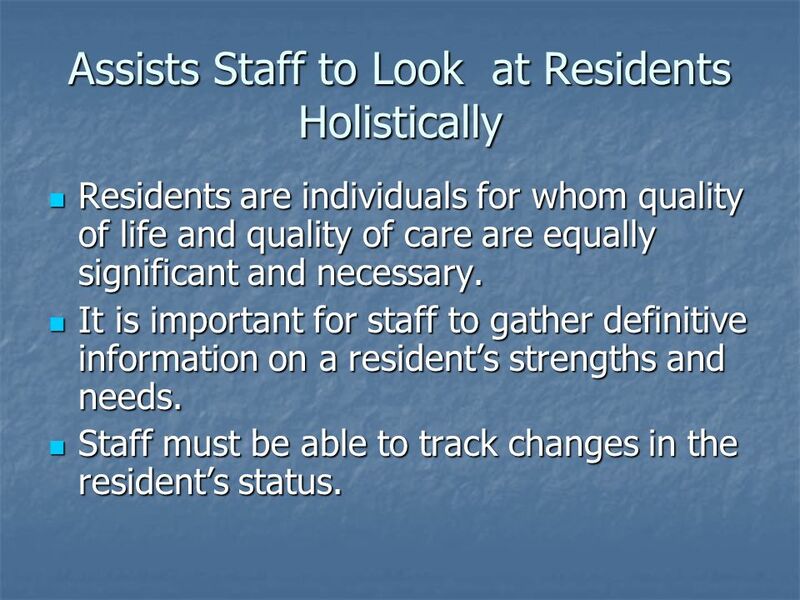 Staff must be able to track changes in the resident’s status. 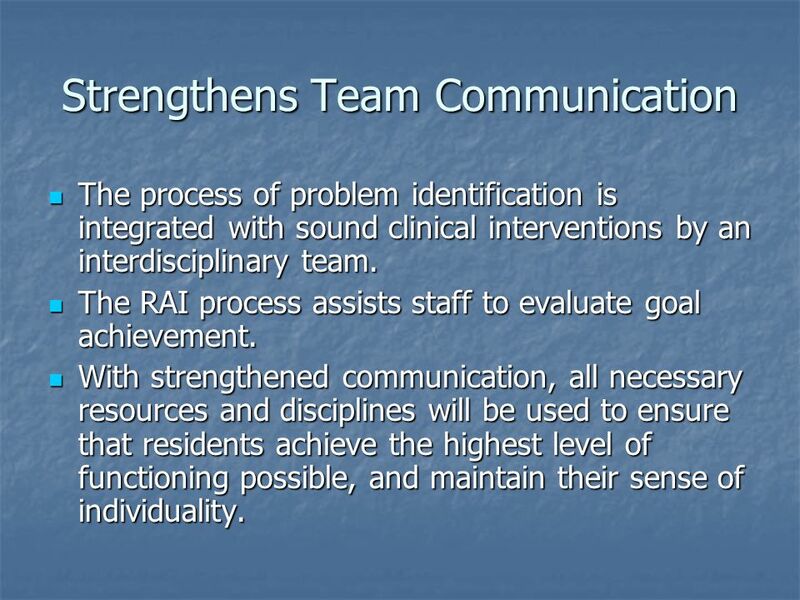 The process of problem identification is integrated with sound clinical interventions by an interdisciplinary team. 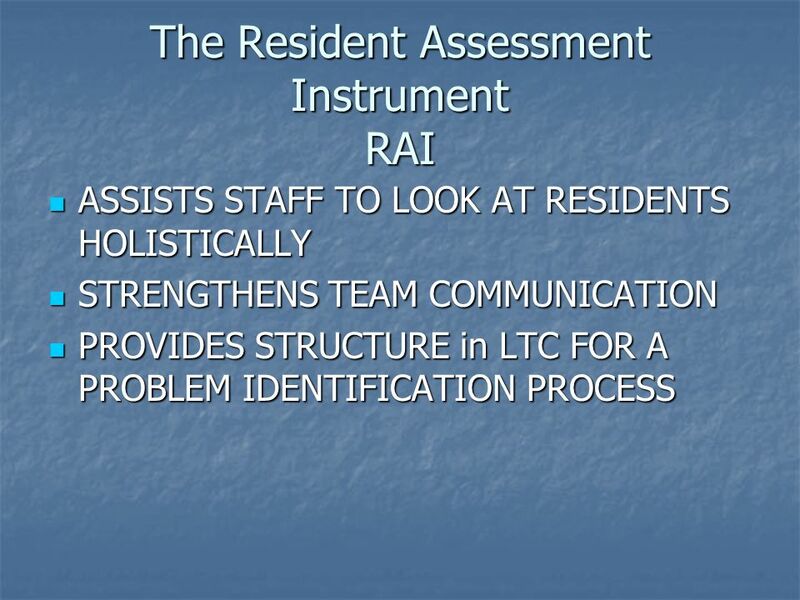 The RAI process assists staff to evaluate goal achievement. With strengthened communication, all necessary resources and disciplines will be used to ensure that residents achieve the highest level of functioning possible, and maintain their sense of individuality. 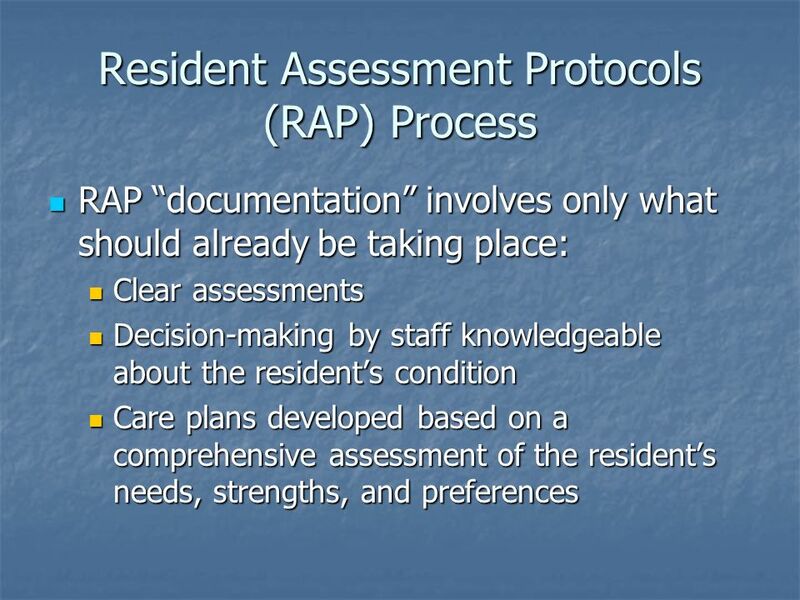 Assessment- Evaluate all observations, information and knowledge about a resident; finding out who the resident is. 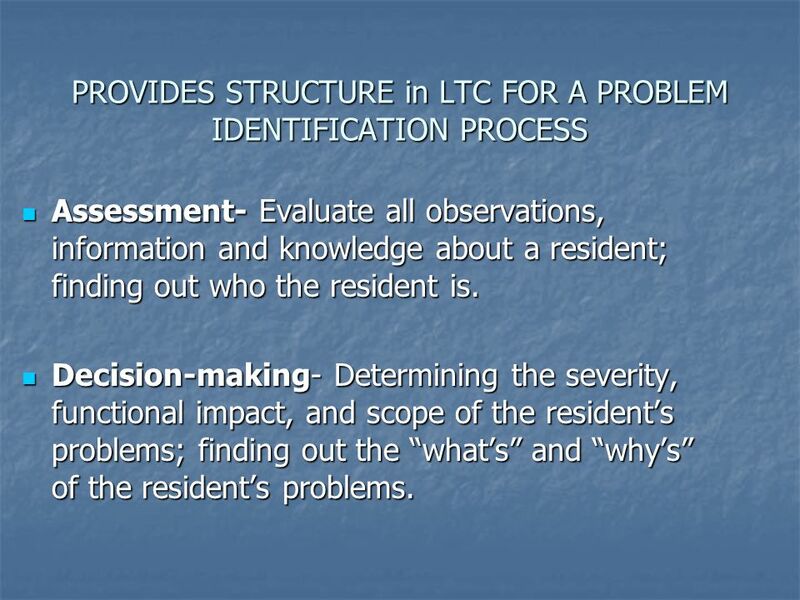 Decision-making- Determining the severity, functional impact, and scope of the resident’s problems; finding out the “what’s” and “why’s” of the resident’s problems. 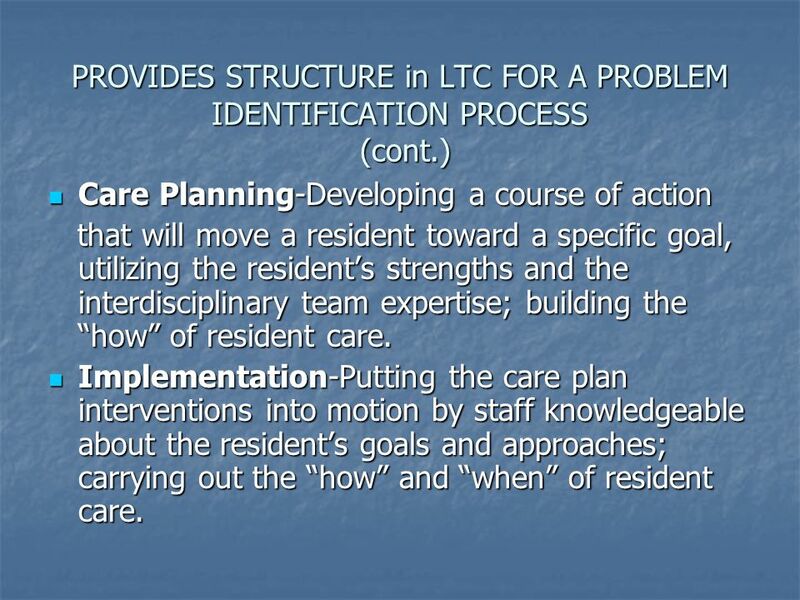 Care Planning-Developing a course of action that will move a resident toward a specific goal, utilizing the resident’s strengths and the interdisciplinary team expertise; building the “how” of resident care. Implementation-Putting the care plan interventions into motion by staff knowledgeable about the resident’s goals and approaches; carrying out the “how” and “when” of resident care. 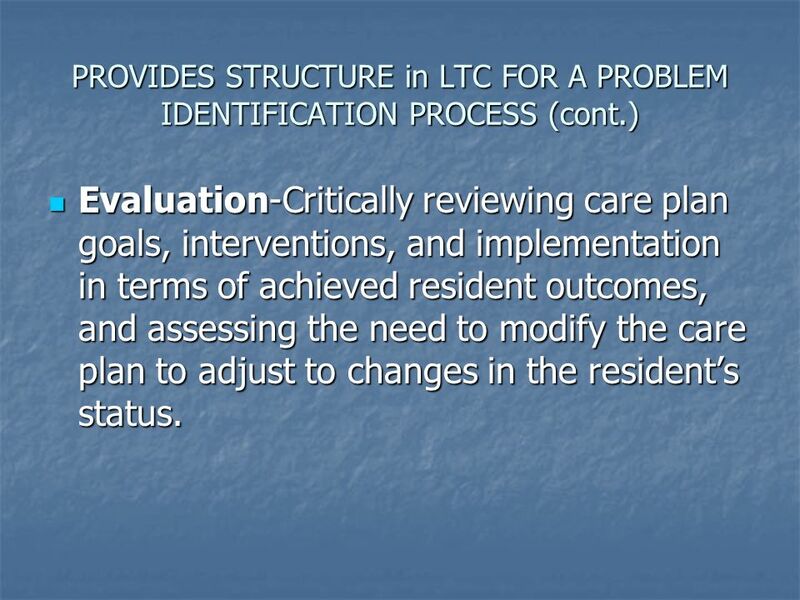 Evaluation-Critically reviewing care plan goals, interventions, and implementation in terms of achieved resident outcomes, and assessing the need to modify the care plan to adjust to changes in the resident’s status. 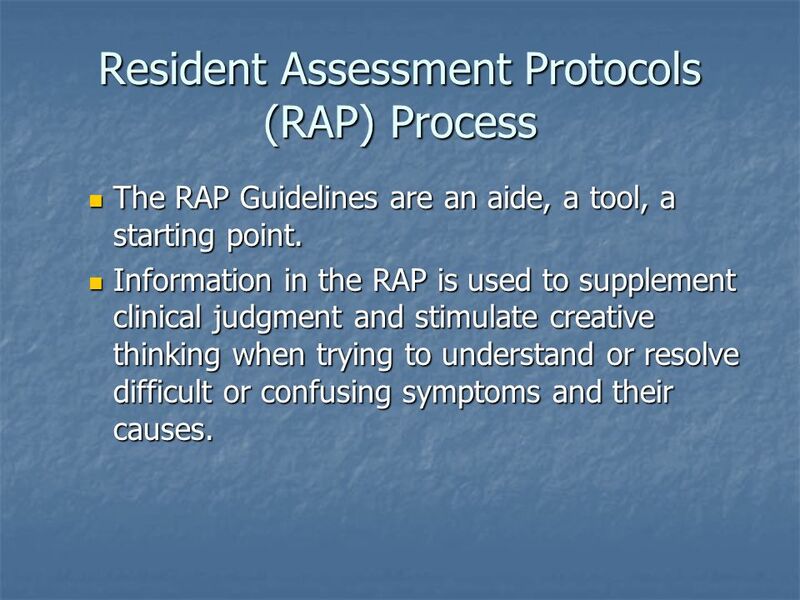 The RAP Guidelines are an aide, a tool, a starting point. 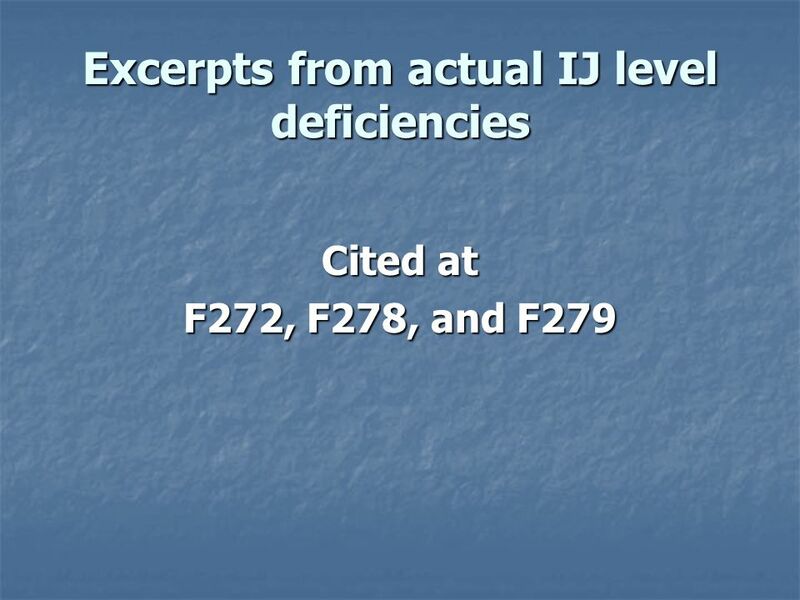 Information in the RAP is used to supplement clinical judgment and stimulate creative thinking when trying to understand or resolve difficult or confusing symptoms and their causes. 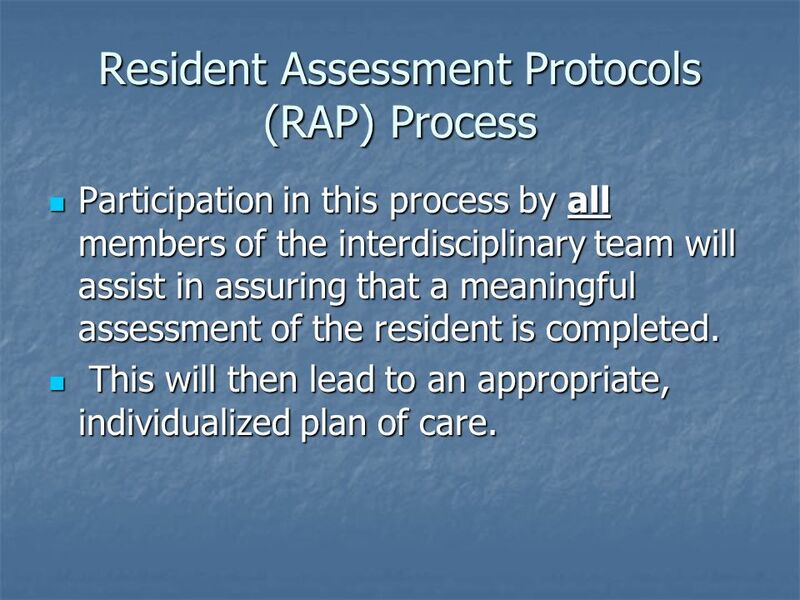 Participation in this process by all members of the interdisciplinary team will assist in assuring that a meaningful assessment of the resident is completed. This will then lead to an appropriate, individualized plan of care. 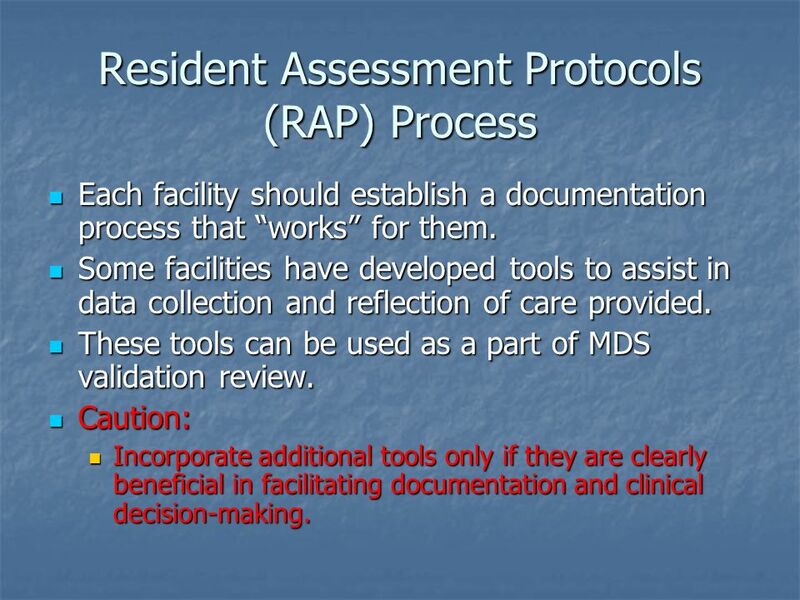 Each facility should establish a documentation process that “works” for them. 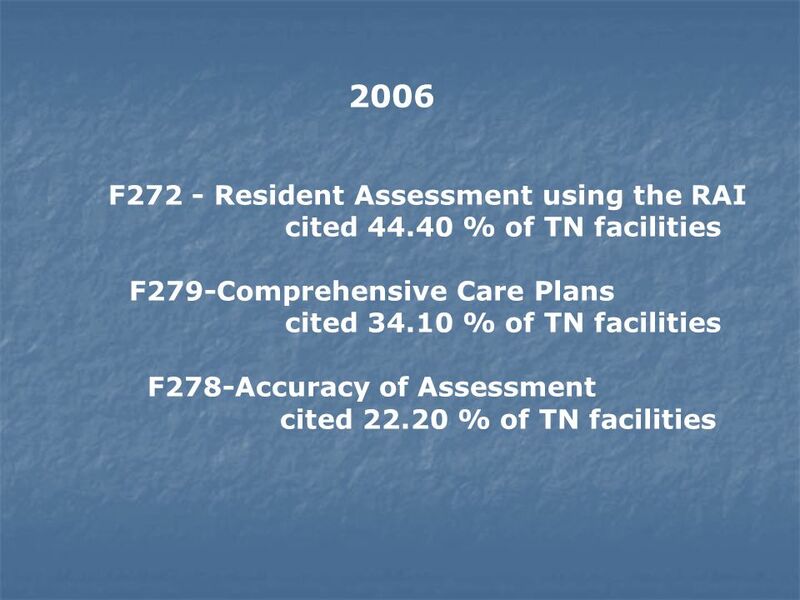 Some facilities have developed tools to assist in data collection and reflection of care provided. 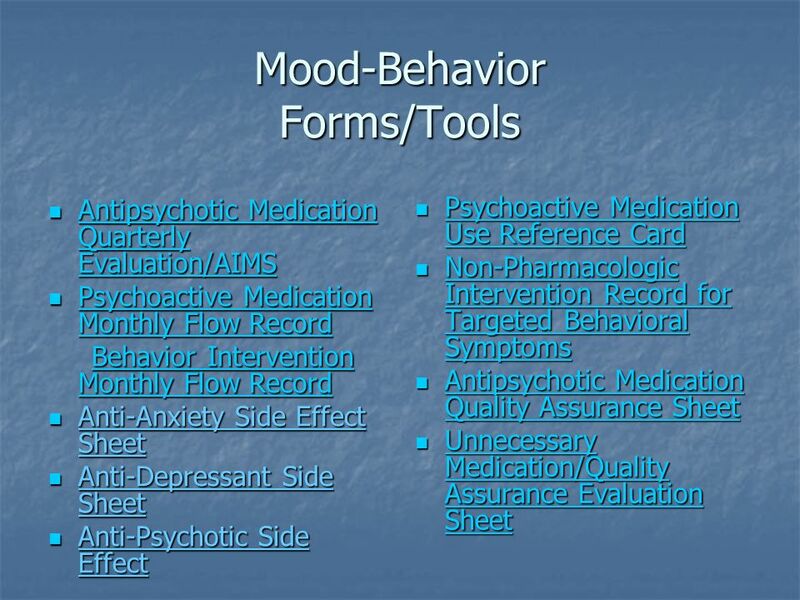 These tools can be used as a part of MDS validation review. Caution: Incorporate additional tools only if they are clearly beneficial in facilitating documentation and clinical decision-making. 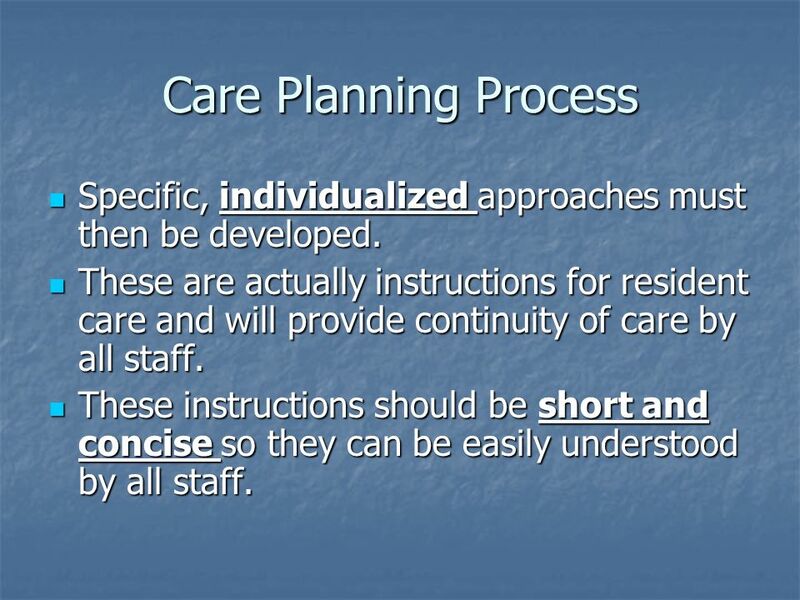 46 Care Planning Process Specific, individualized approaches must then be developed. 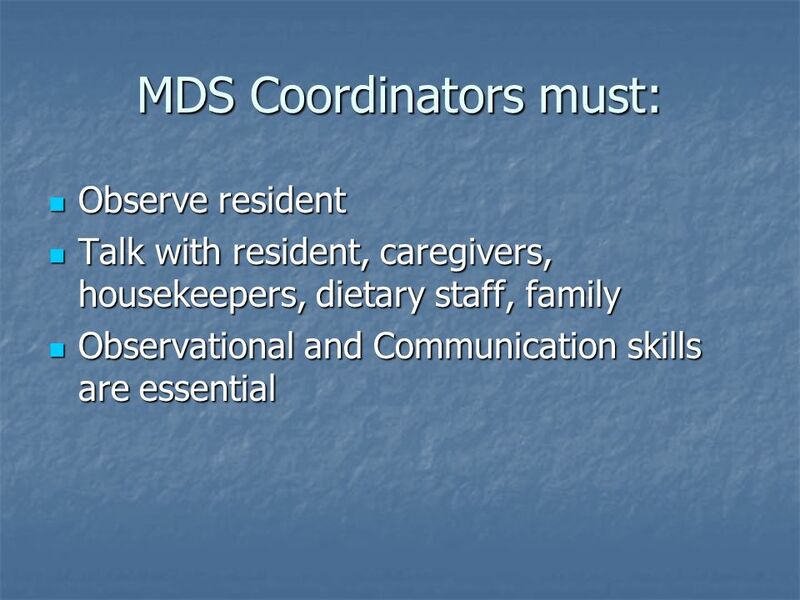 These are actually instructions for resident care and will provide continuity of care by all staff. These instructions should be short and concise so they can be easily understood by all staff. 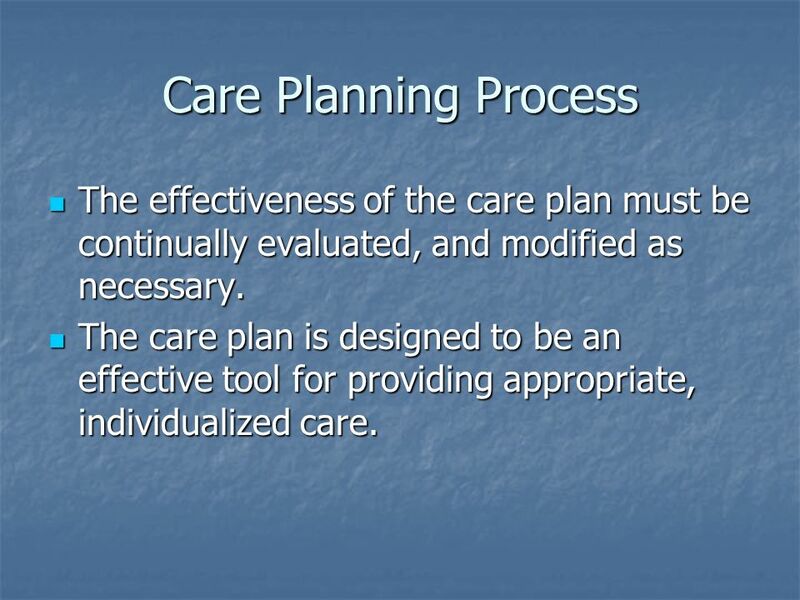 47 Care Planning Process The effectiveness of the care plan must be continually evaluated, and modified as necessary. 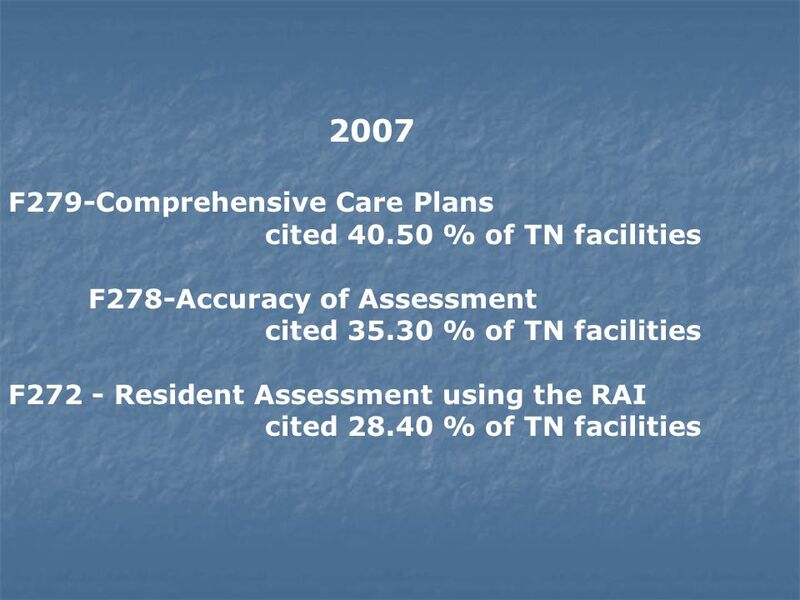 The care plan is designed to be an effective tool for providing appropriate, individualized care. 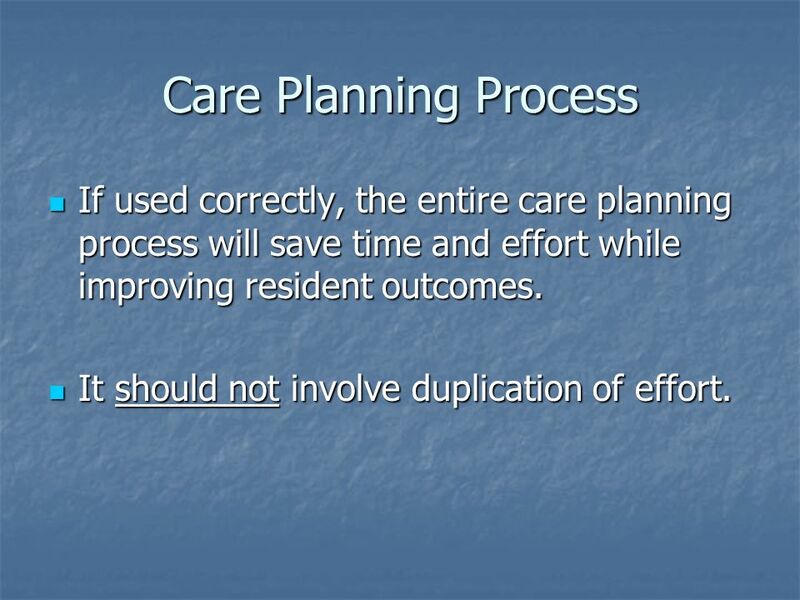 48 Care Planning Process If used correctly, the entire care planning process will save time and effort while improving resident outcomes. It should not involve duplication of effort. 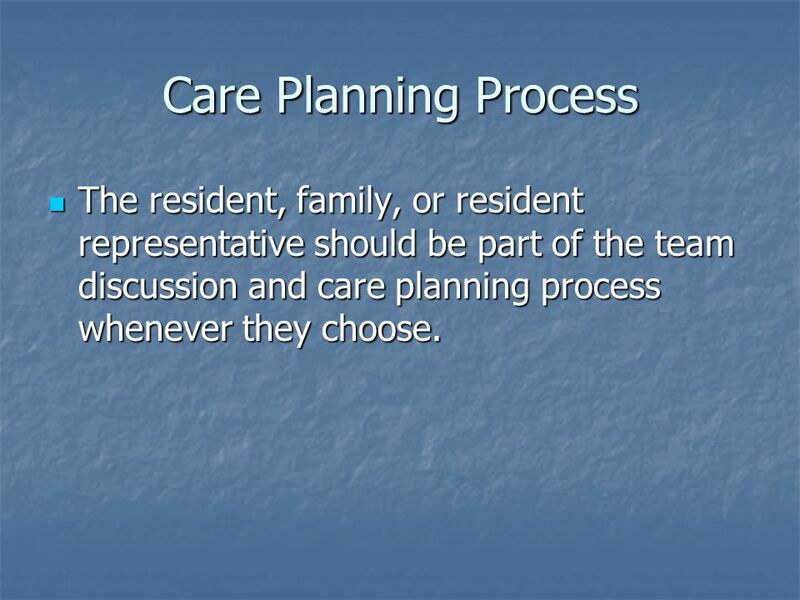 49 Care Planning Process The resident, family, or resident representative should be part of the team discussion and care planning process whenever they choose. 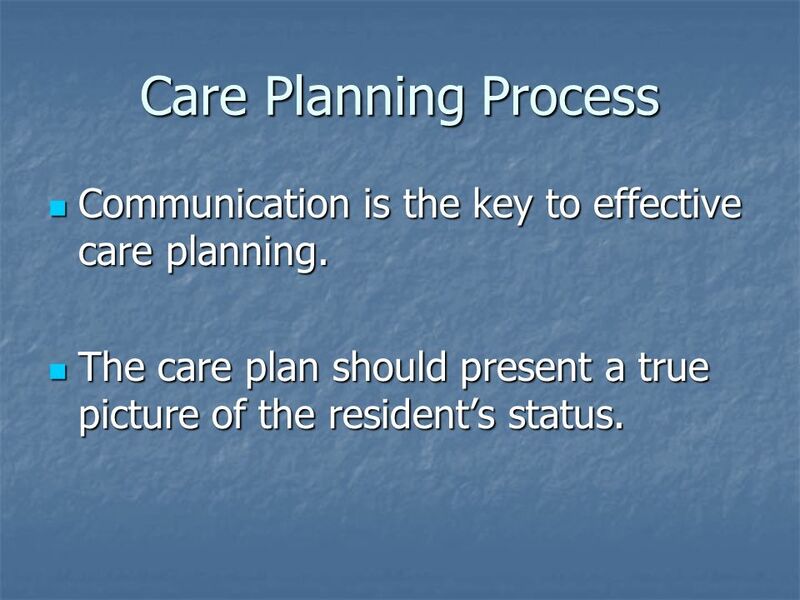 50 Care Planning Process Communication is the key to effective care planning. 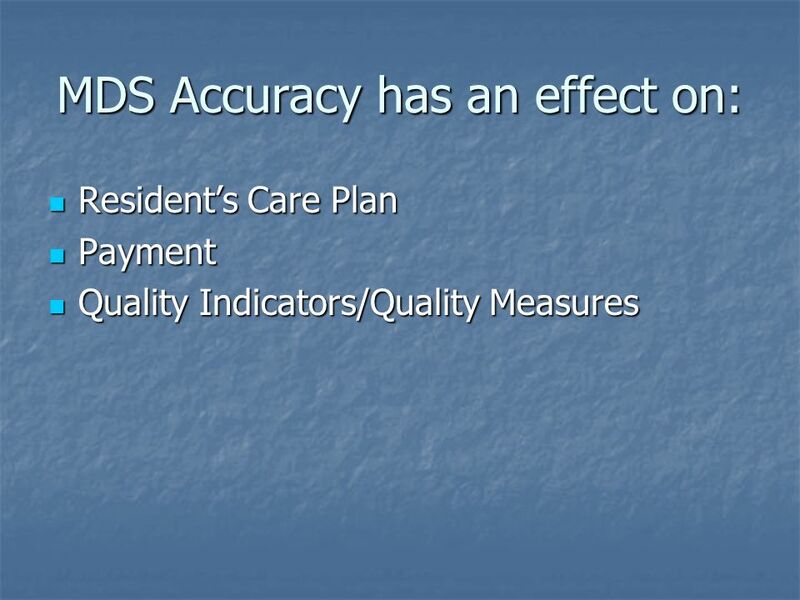 The care plan should present a true picture of the resident’s status. 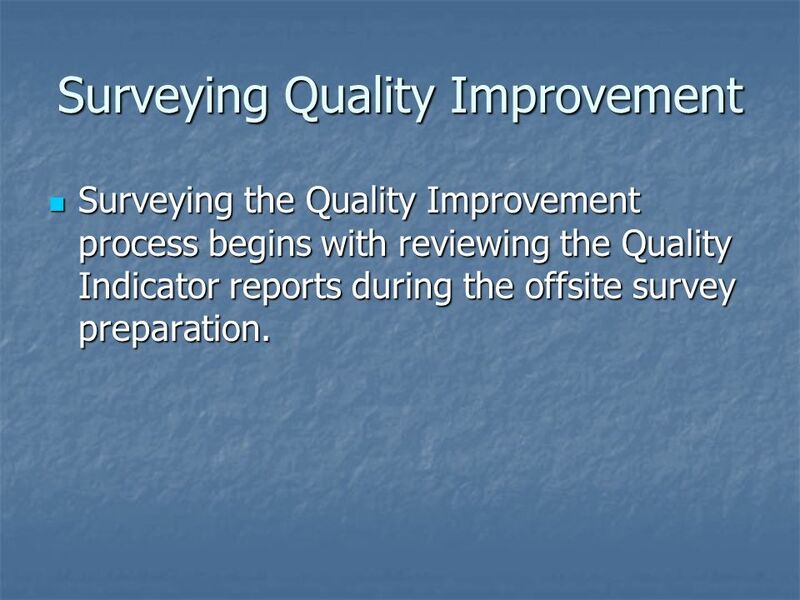 Surveying the Quality Improvement process begins with reviewing the Quality Indicator reports during the offsite survey preparation. 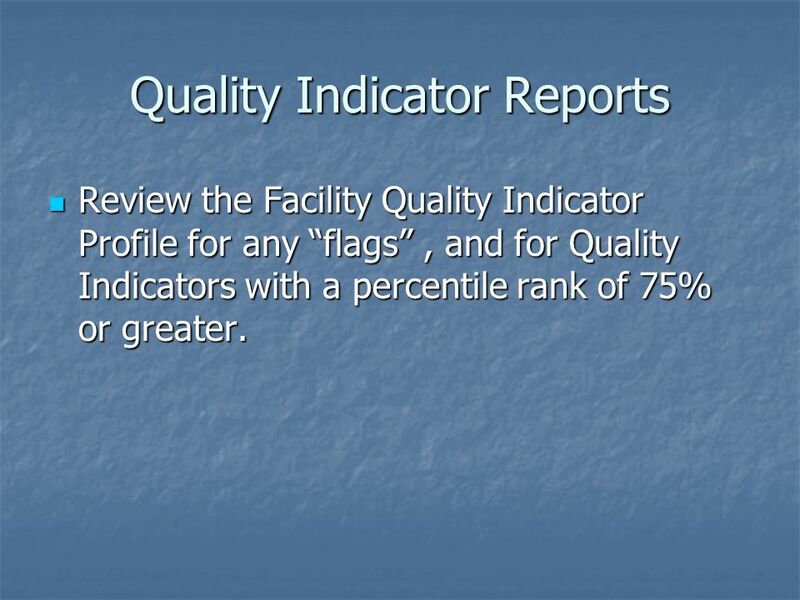 Review the Facility Quality Indicator Profile for any “flags” , and for Quality Indicators with a percentile rank of 75% or greater. 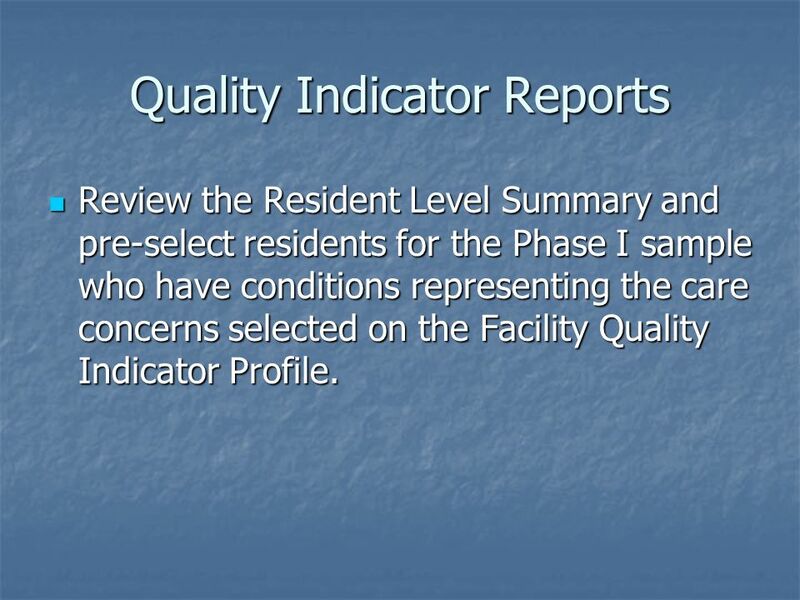 Review the Resident Level Summary and pre-select residents for the Phase I sample who have conditions representing the care concerns selected on the Facility Quality Indicator Profile. 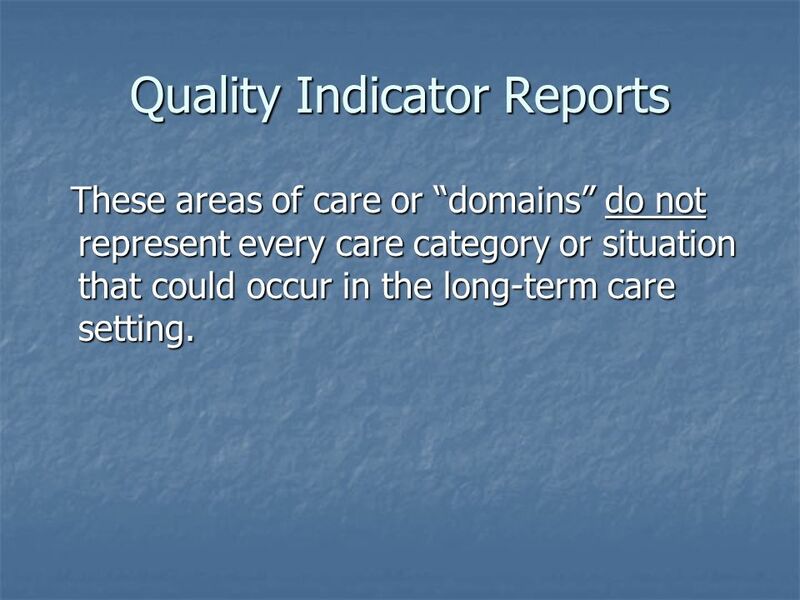 These areas of care or “domains” do not represent every care category or situation that could occur in the long-term care setting. 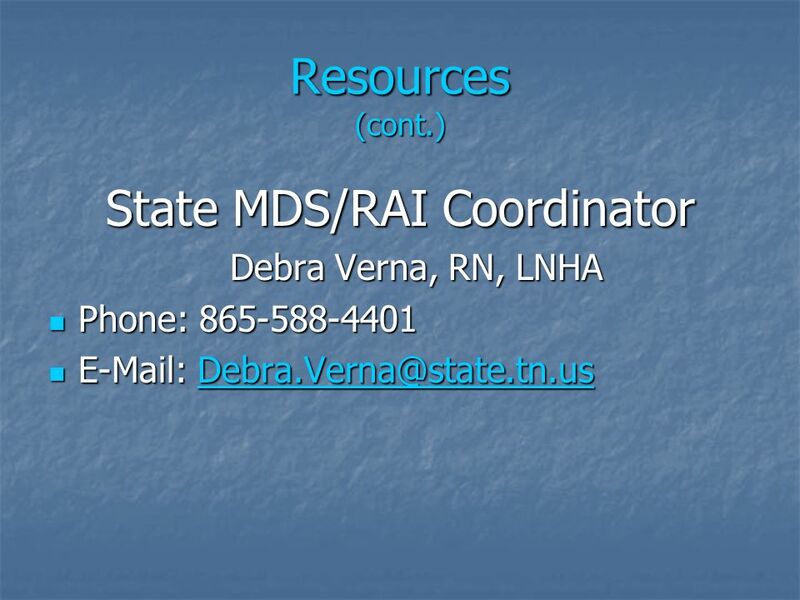 They do represent common conditions and important aspects of care and life to residents. 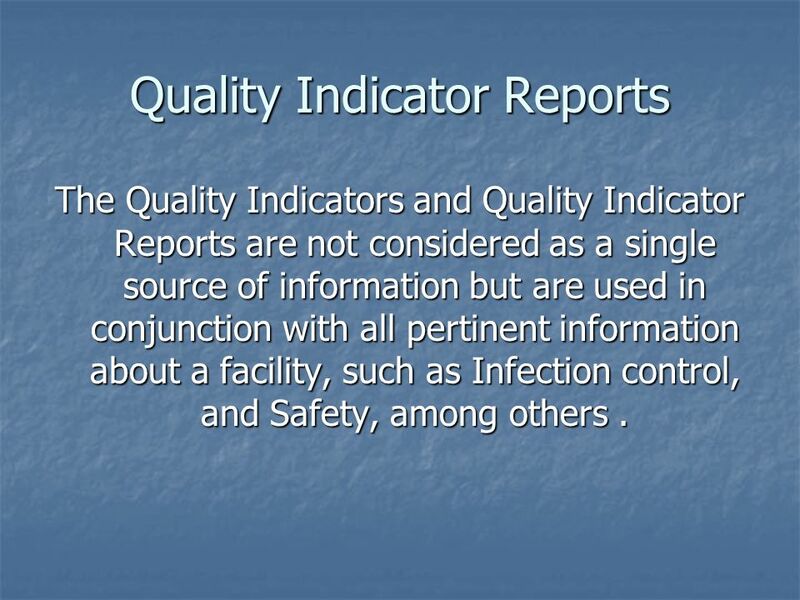 The Quality Indicators and Quality Indicator Reports are not considered as a single source of information but are used in conjunction with all pertinent information about a facility, such as Infection control, and Safety, among others . 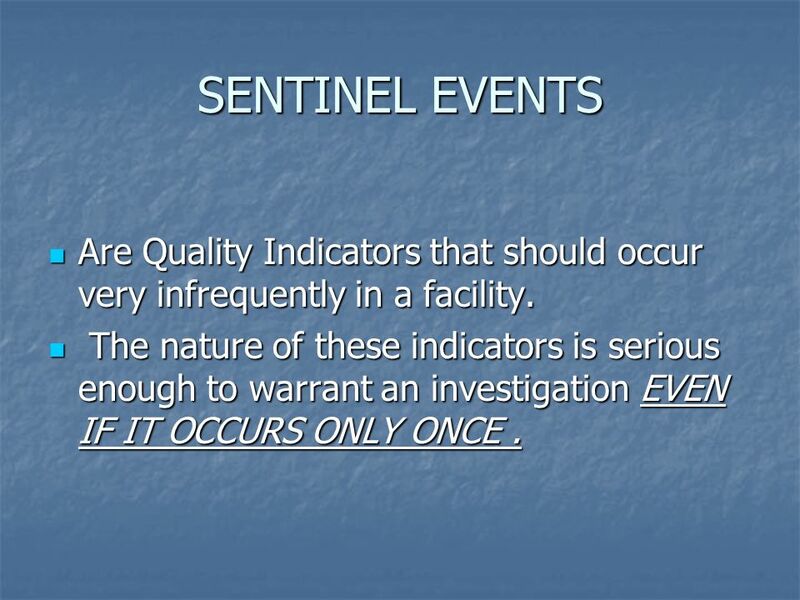 63 SENTINEL EVENTS Are Quality Indicators that should occur very infrequently in a facility. 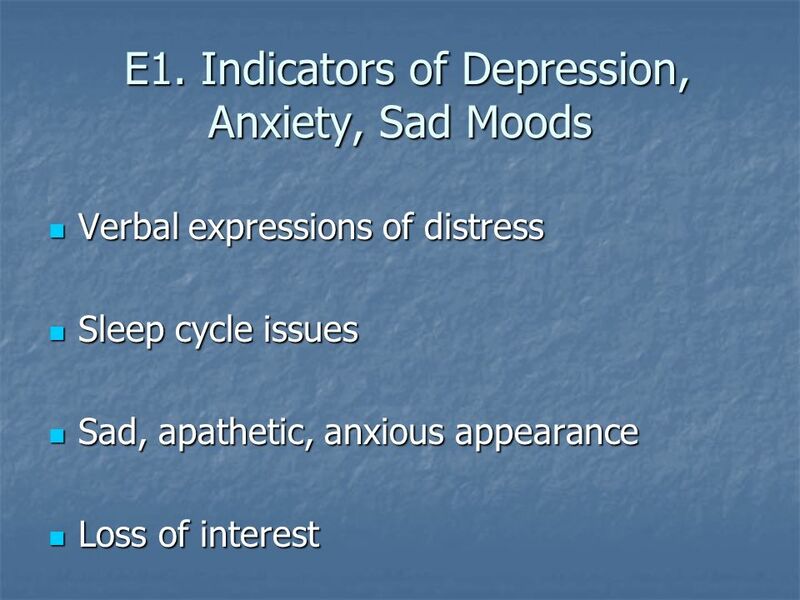 The nature of these indicators is serious enough to warrant an investigation EVEN IF IT OCCURS ONLY ONCE . 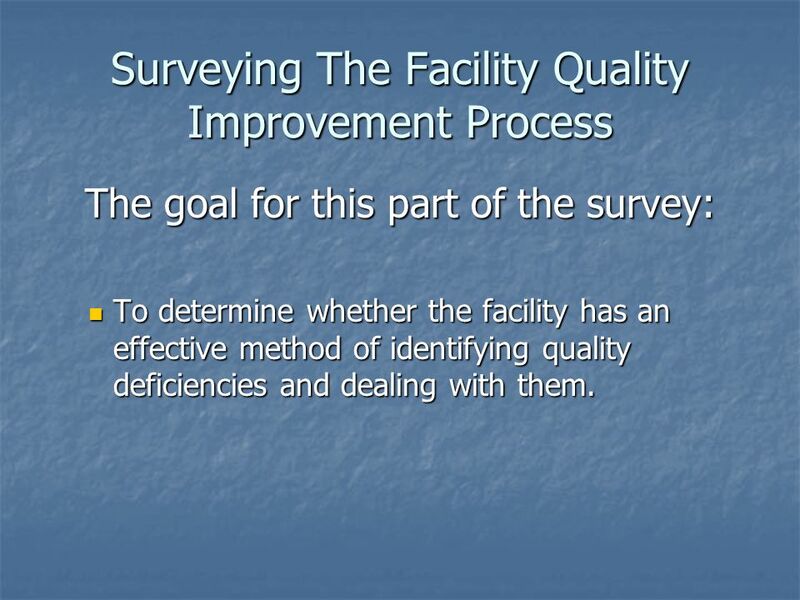 The goal for this part of the survey: To determine whether the facility has an effective method of identifying quality deficiencies and dealing with them. 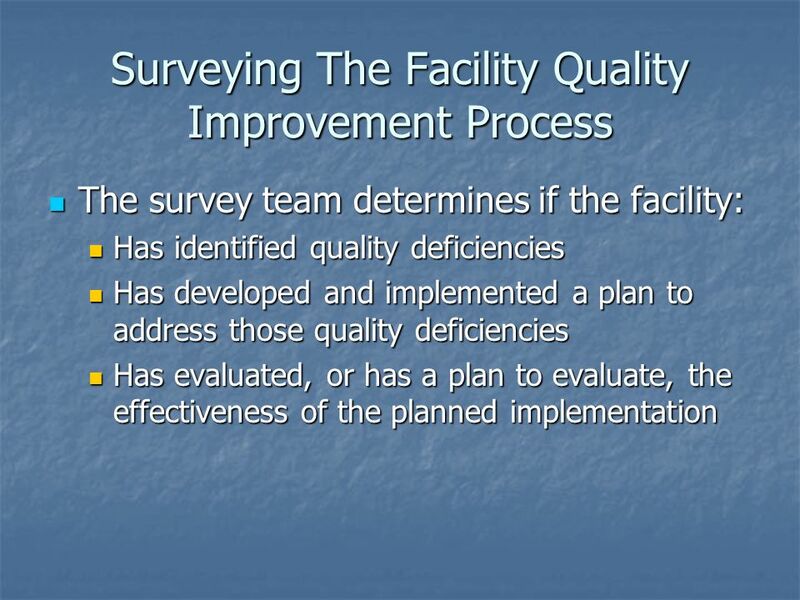 Does the facility have a QA/QI Committee which addresses quality concerns and do staff know how to access that process? 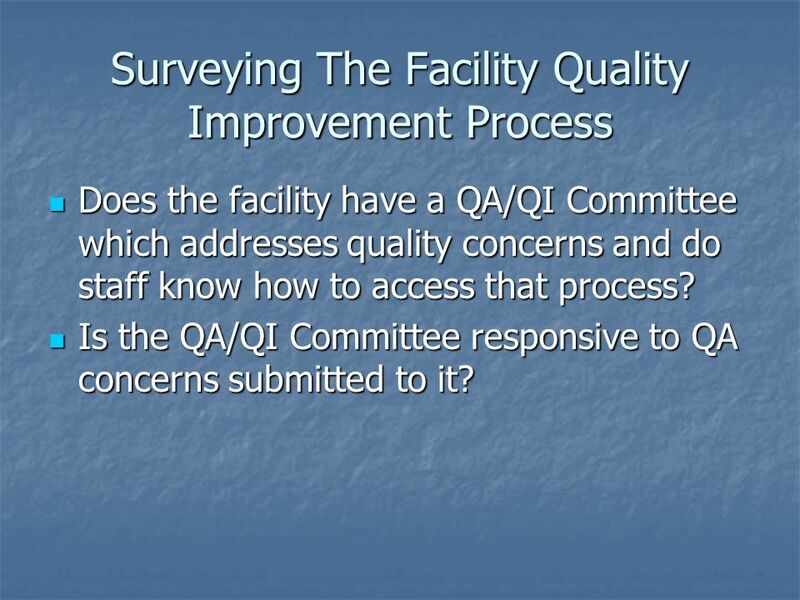 Is the QA/QI Committee responsive to QA concerns submitted to it? 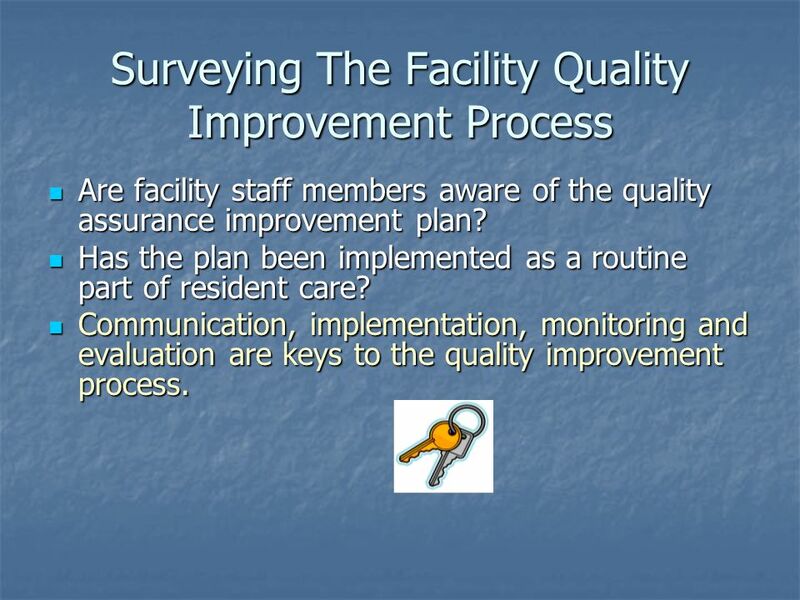 Are facility staff members aware of the quality assurance improvement plan? 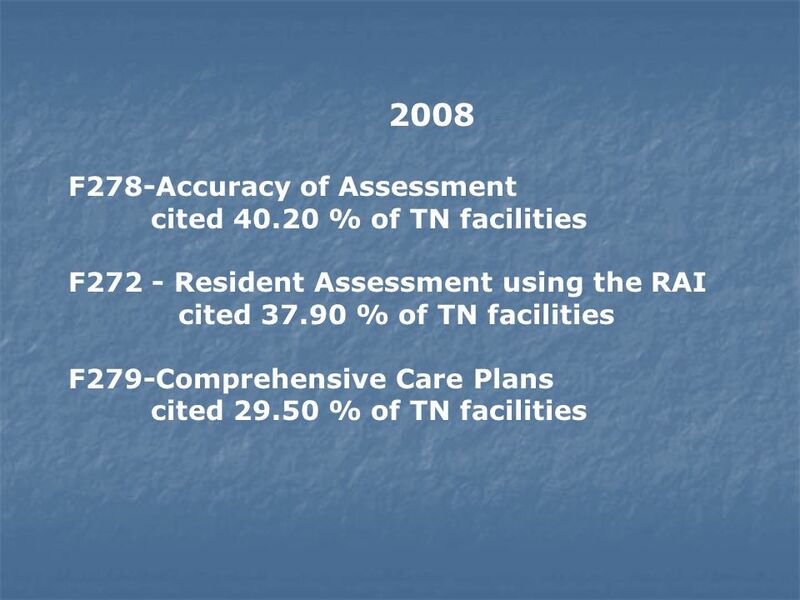 Has the plan been implemented as a routine part of resident care? 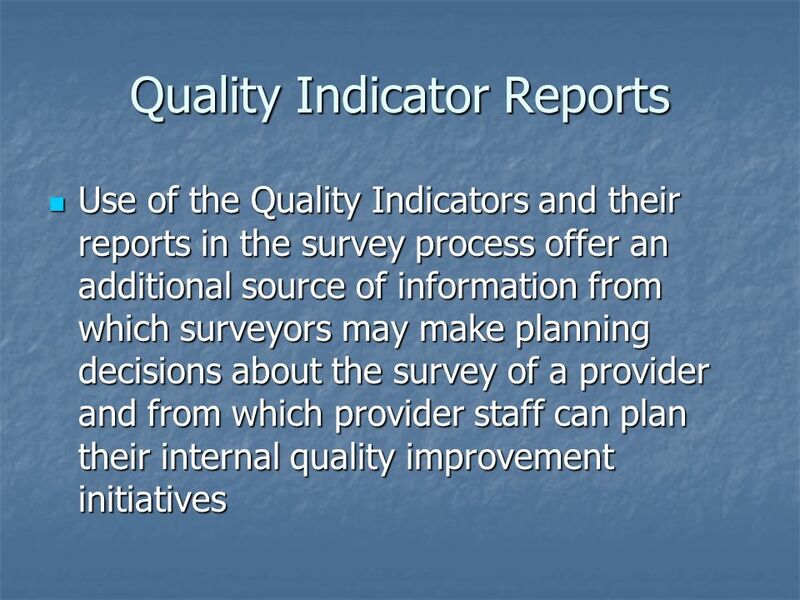 Communication, implementation, monitoring and evaluation are keys to the quality improvement process. 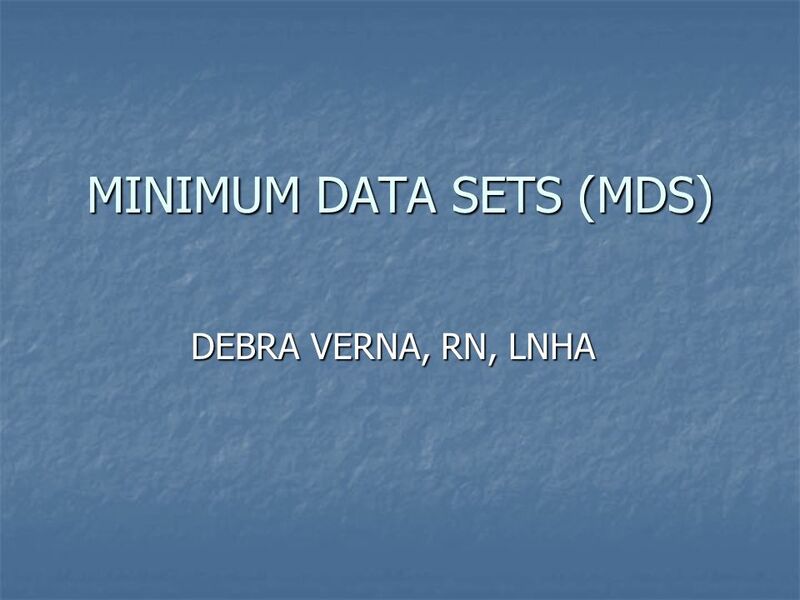 Download ppt "MINIMUM DATA SETS (MDS)"
Overview RAI / MDS Presented by Leatrice Coffin BSN, RN MDS Education Coordinator. 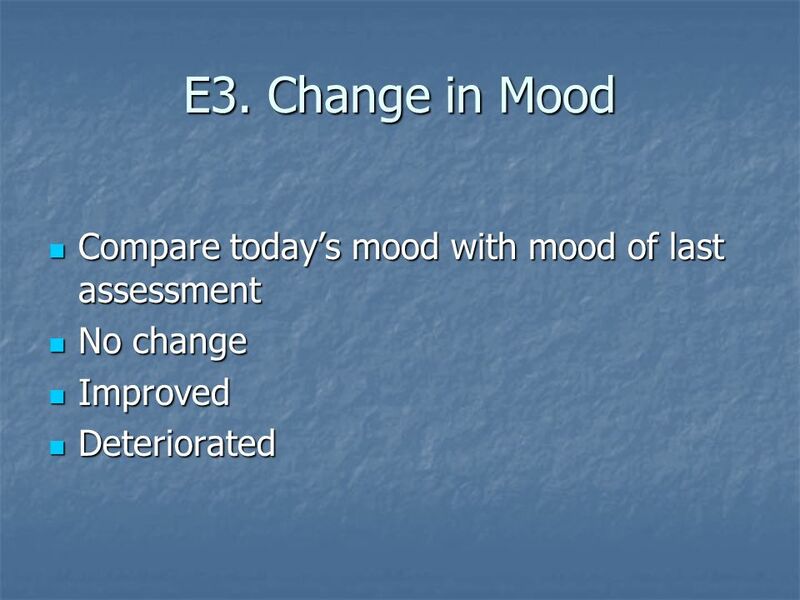 PAIN MANAGEMENT RELATIVE TO MDS F309. 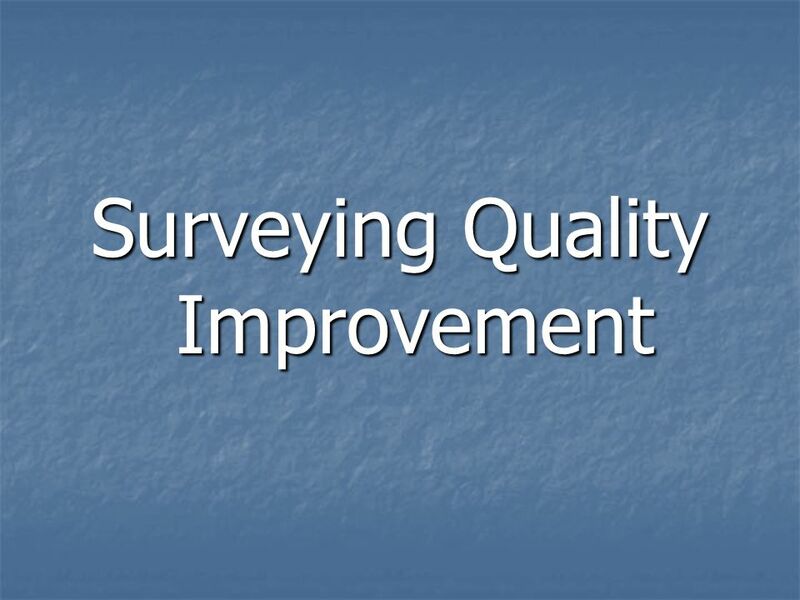 March 25, Quality Assurance Overview. 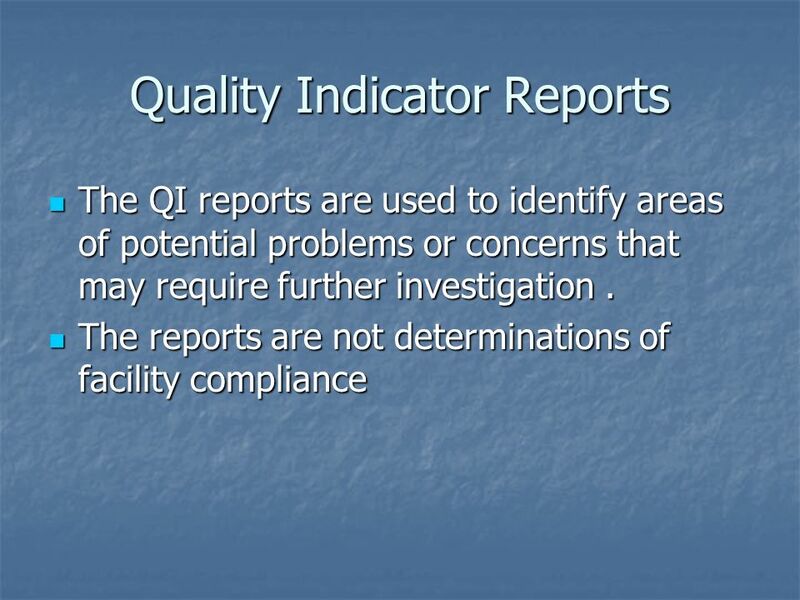 March 25, Quality Assurance System Overview FY 04/05- new Quality Assurance tools implemented, taking. Quality Management Branch Cady Clark, MSN, RN Branch Manager Claudia Himes-Crayton, BSN, RN Patricia Palm, MS, RNC Nurse Consultants. 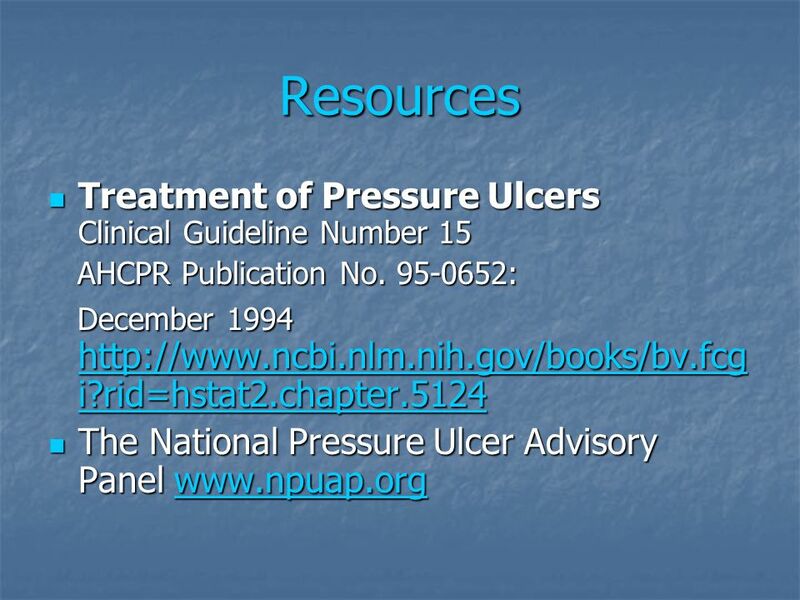 Long Term Care Provider Associations Meeting Sharon White CMS – Region V August 22, 2007 F314 – Pressure Ulcers. Privacy Impact Assessment Future Directions TRICARE Management Activity HEALTH AFFAIRS 2009 Data Protection Seminar TMA Privacy Office. 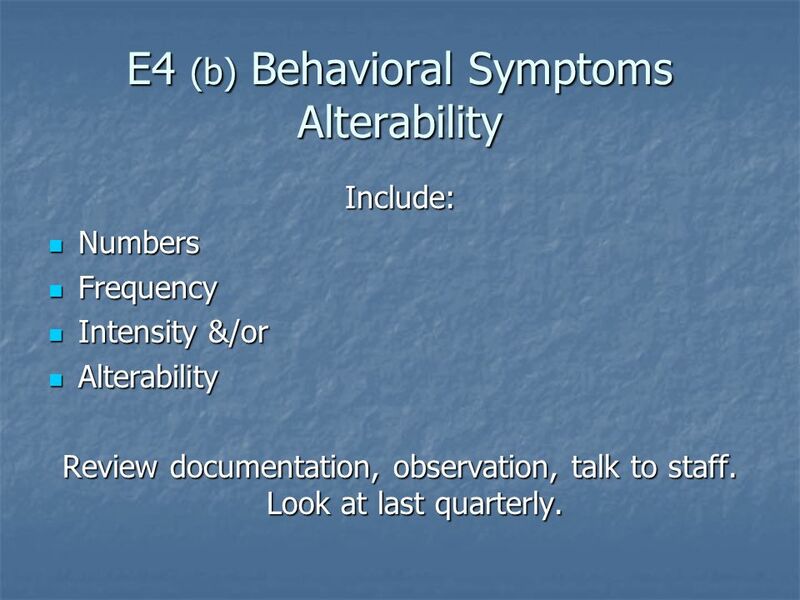 Module 4: Establishing a Data-based Decision- making System. 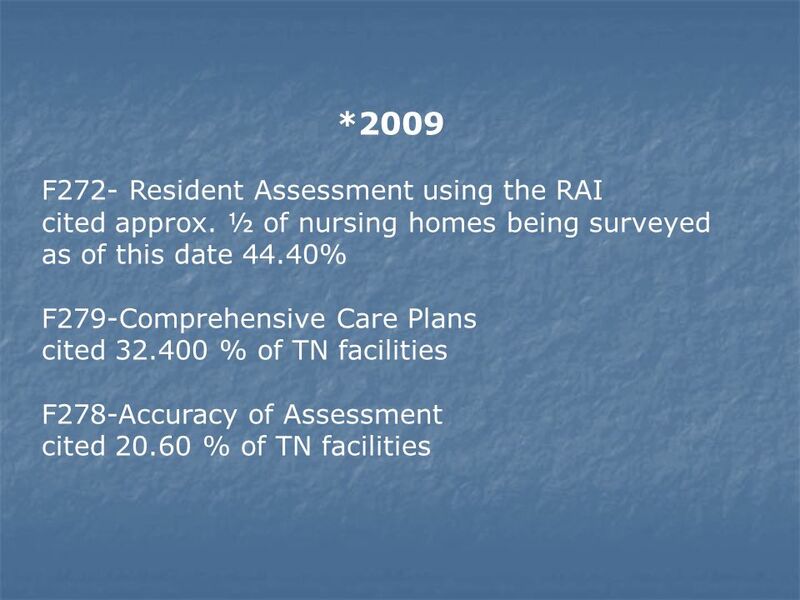 The Aged Care Standards and Accreditation Agency Ltd Continuous Improvement in Residential Aged Care. 1 LTC Trend Tracker TM Your Gateway to Performance Improvement A New Free AHCA/NCAL Member Benefit Go To To Learn Morewww.LTCTrendTracker.com. 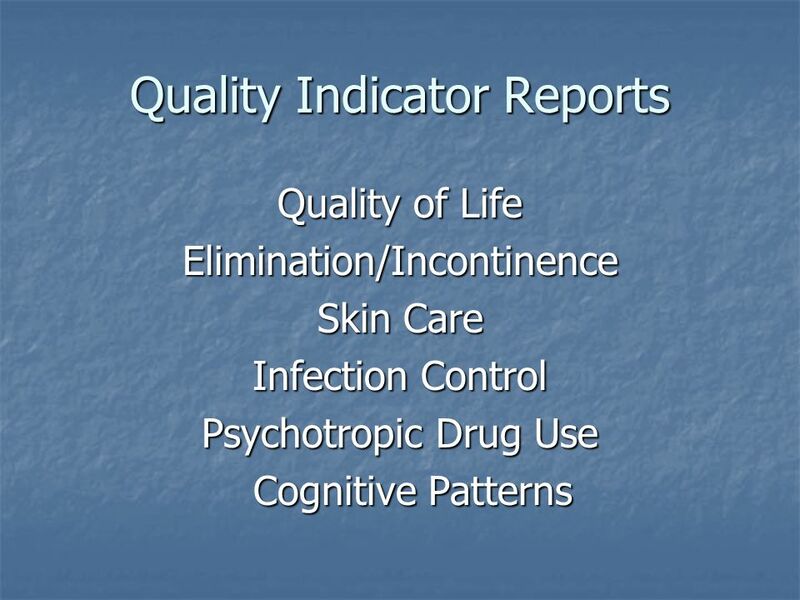 Improving Pain Management An Introduction to Continuous Quality Improvement Gwendolen Buhr, MD May 30, 2003.